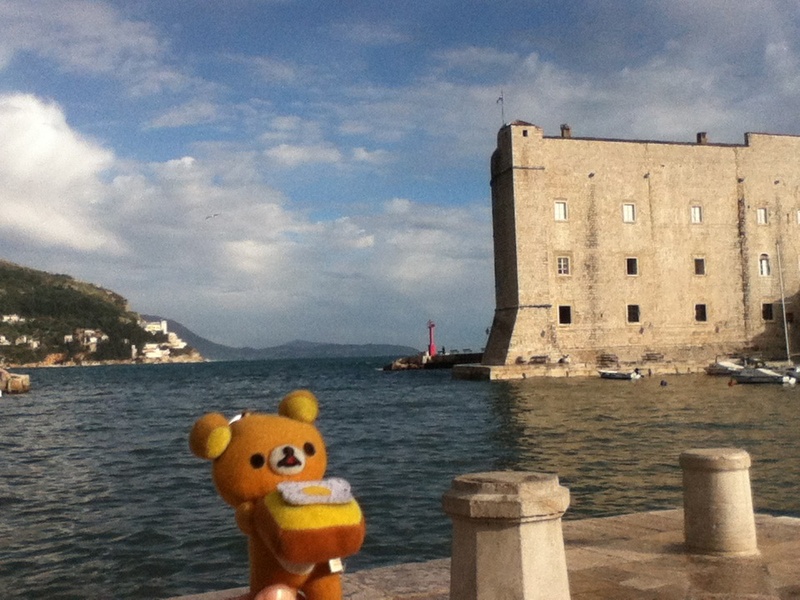 2014.08.25 56ヶ国目、クロアチア！リエカは美しい / Rijeka, Croatia! I got up by 8am. As I was not moving to other place, I could have a relaxed morning. 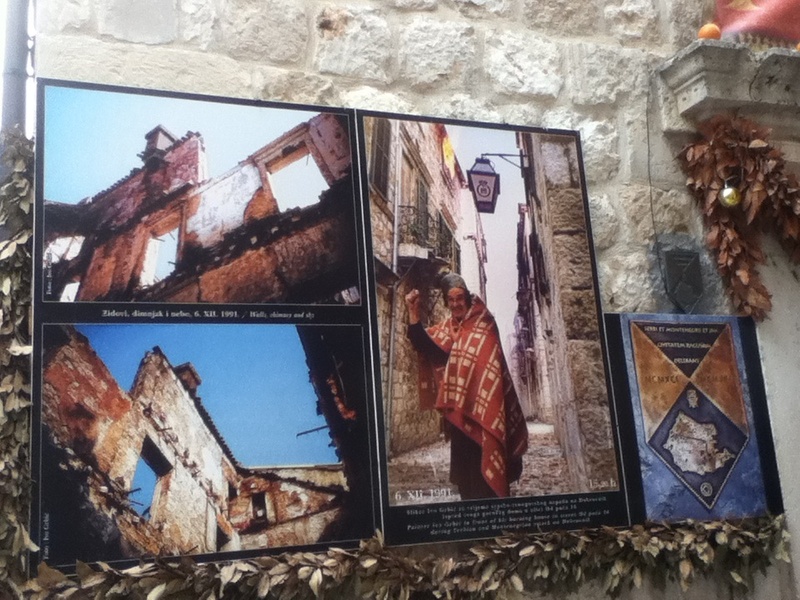 While having breakfast, the owner told is (me and Miguel) about the histories of Dubrovnik and Croatia. The first question I got was "Why the territory of Bosnia Hercegovina is cutting the northern part of Croatia and Dubrovnik. 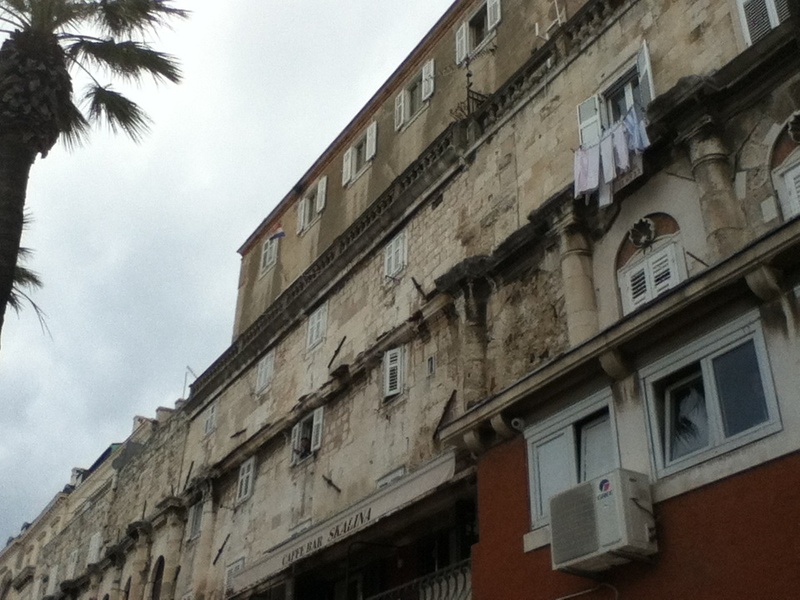 According to the owner, hundreds of years ago, the habitants of those Croatians were spreading to current Northern Croatia, Bosnia Hercegovina and the state of Dubrovnik. 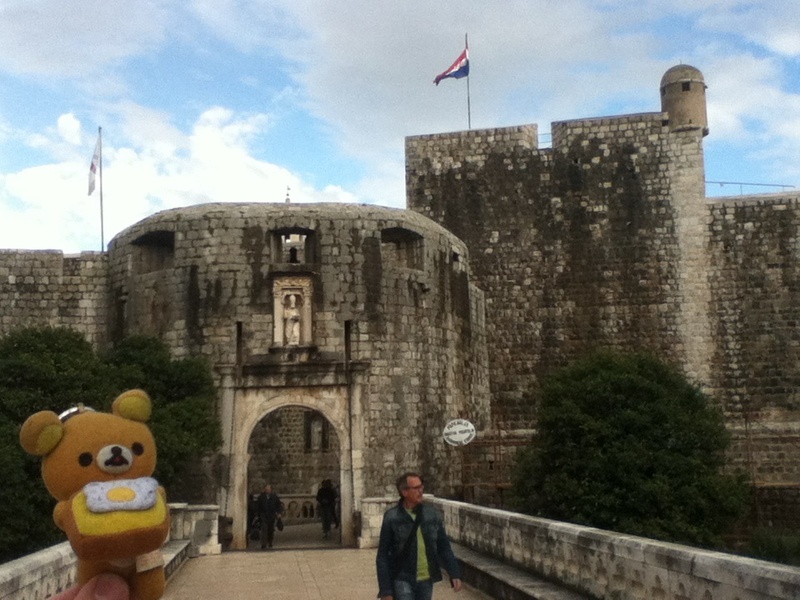 Yes Dubrovnik was independent state at that time. 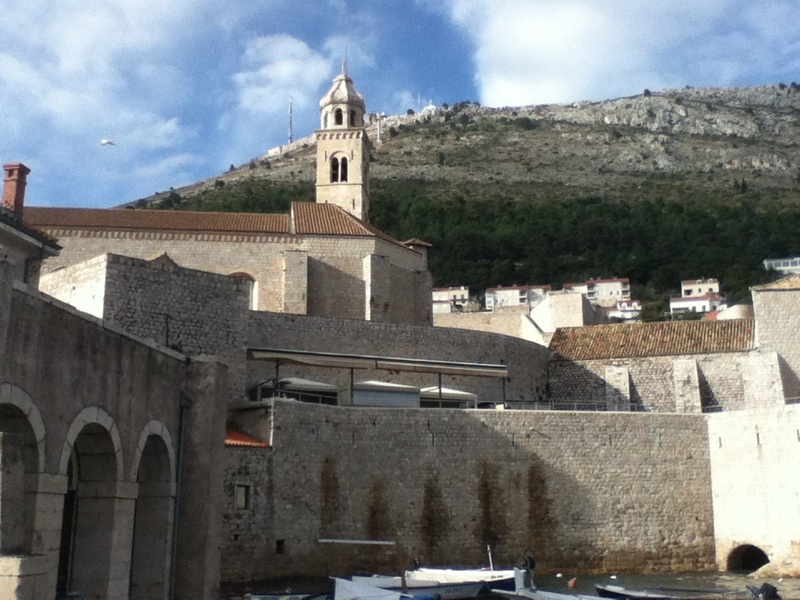 The state of Dubrovnik was flourishing with trading, so it did not need, more it did not want to be united with other Croatian state. 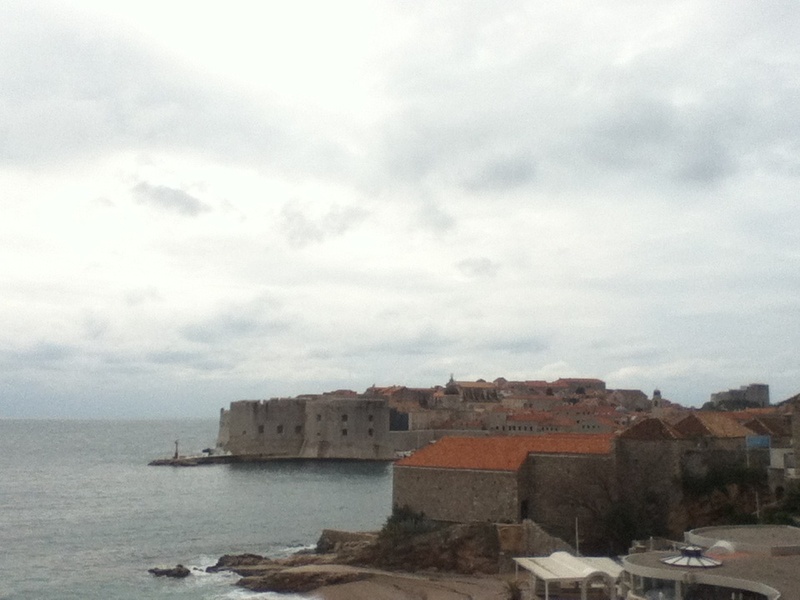 So Dubrovnik gave away a small passage to the sea to Bosnia. It was as narrow as just two donkeys could walk pass. Then in the early 20th century, those three states were united with Yugoslavia. After the WWII, the president of Yugoslavia Tito decided to exchange Bosnian's passage to the sea at current Montenegro with the current passage between Split and Dubrovnik. So the width of two donkeys was extended to 13km. 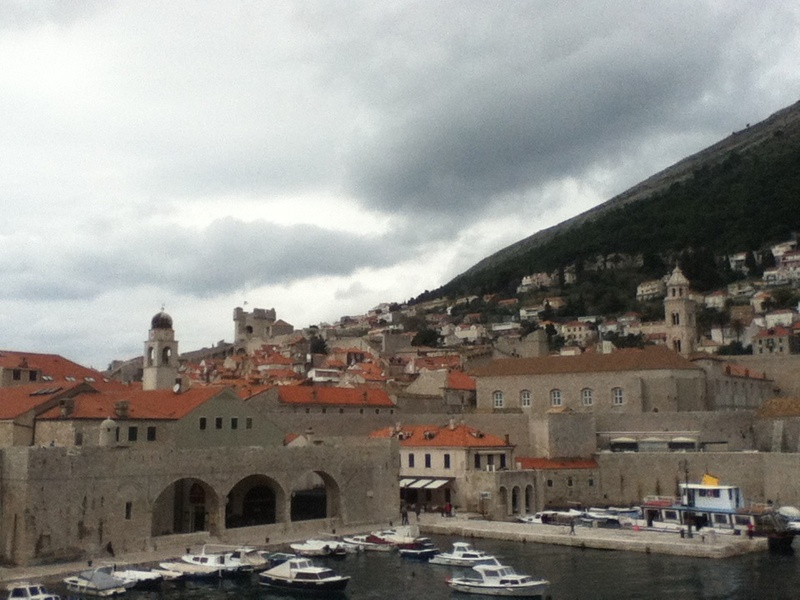 Neither Croatia nor Dubrovnik gain anything. In Bosnia as mentioned before there were Croatians living, but it was conquered by the Ottoman Empire, so those Croatians fled to other Croatian states. Then during Yugoslavia rule, Bosnia was made to be more Serbian. In Yugoslavia time, Serbians were taking those positions with authority such as military and police. Then they suppressed other member of Yugoslavia. Then it became one of the triggers of the civil war from 1991. 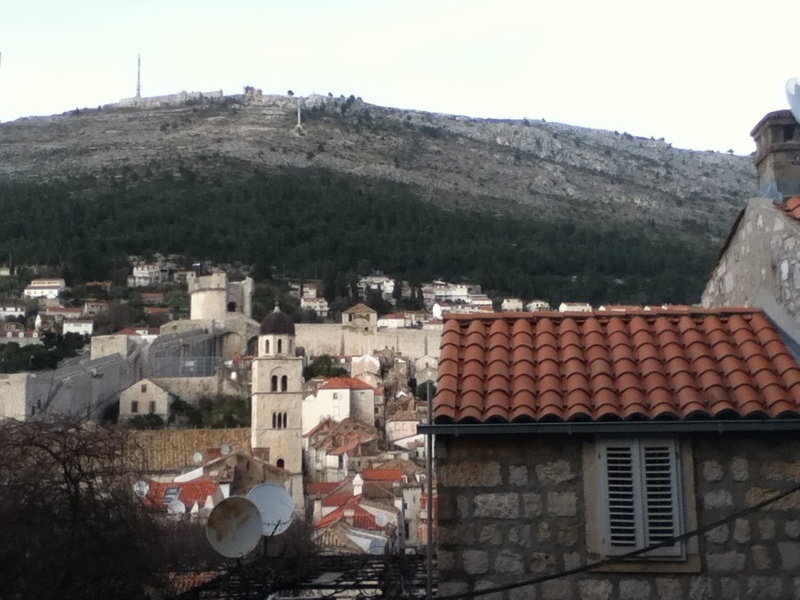 Croatians and Serbians, they are almost akin - their languages are very similar. But Croatians are catholic and Serbians are orthodox. This also is the major cause of the conflict. Russian - the orthodox - was supporting Serbians and the USA and other west nations were supporting anti-Serbians. This made the issue even more complicated. 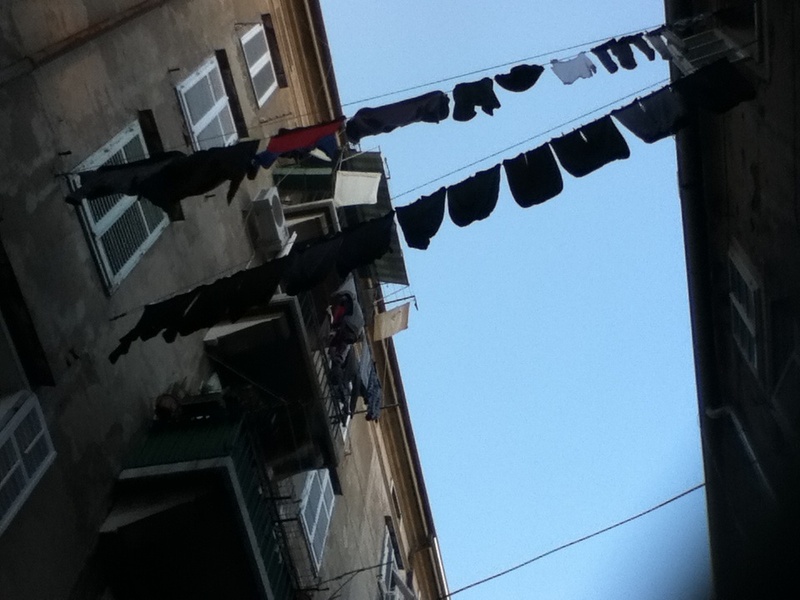 It is hard to understand the history of the conflicts among the former Yugoslavia nations. 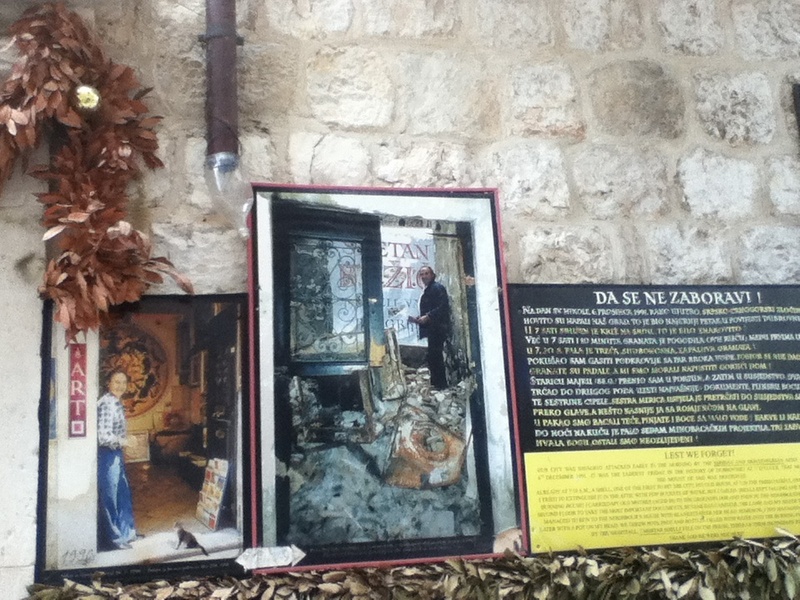 So it was good to hear the story from the local, well only the Croatian side of the story, but it was worth listening to. 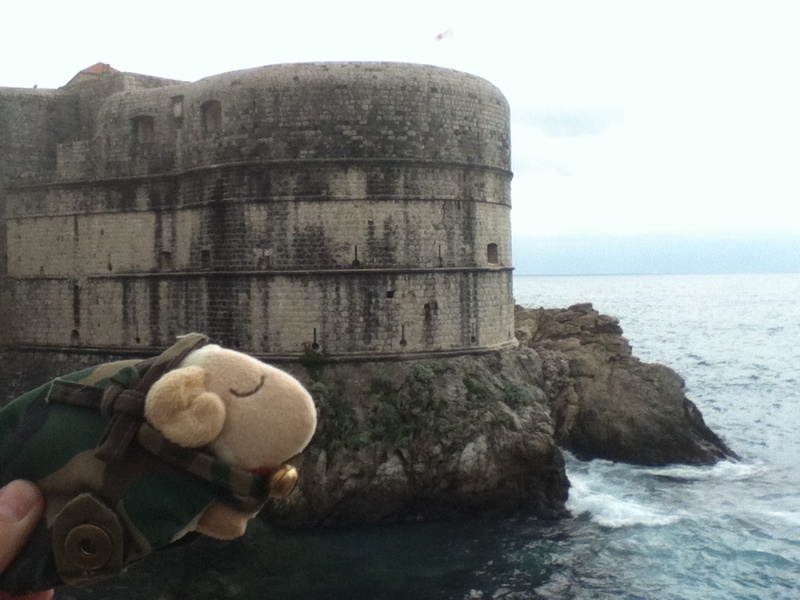 Miguel was heading to Split, so he had to go. It was cloudy but less chance of rain. He should be fine! We spent only a day together but it was fun! See you on the road! Bom viaje! 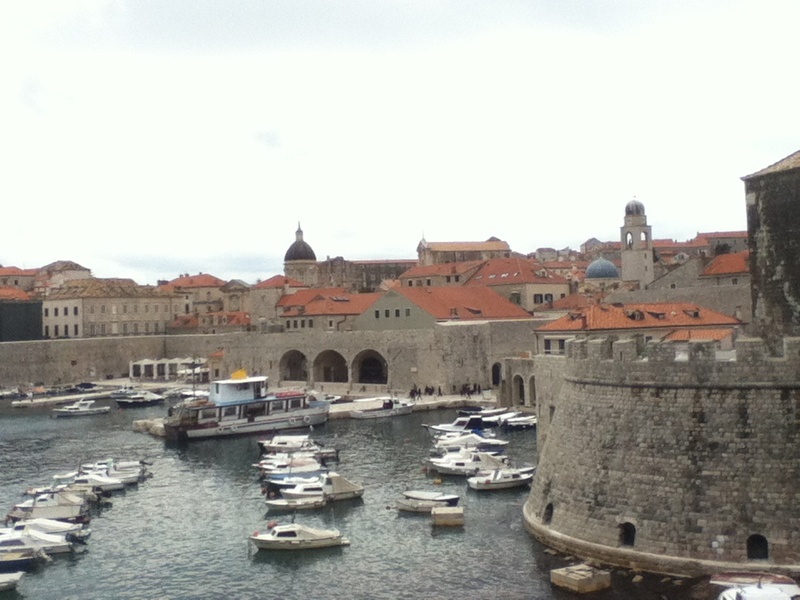 After seeing off Miguel, I walked to the old town. It was 3km away, so it was an easy walk. 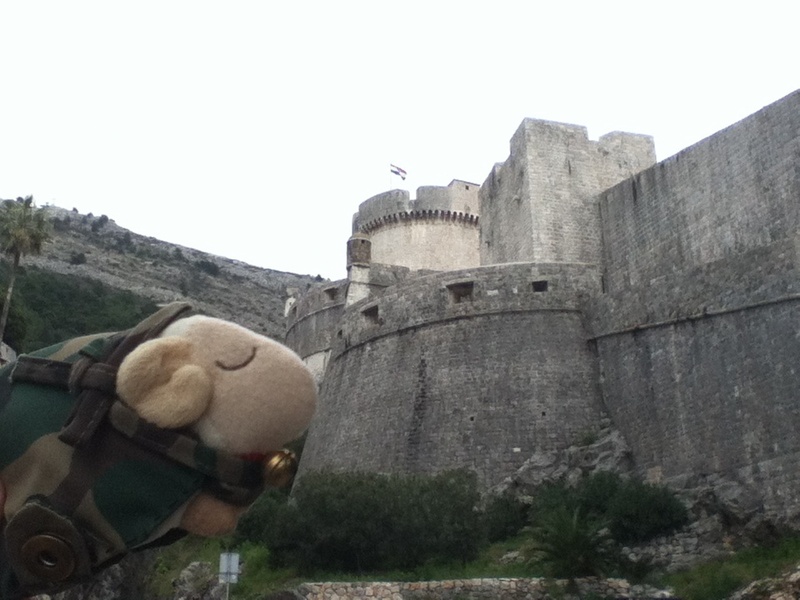 Today I was with Mr. Sheep! Today is his day! Yesterday I walked inside the wall, so I walked outside today. 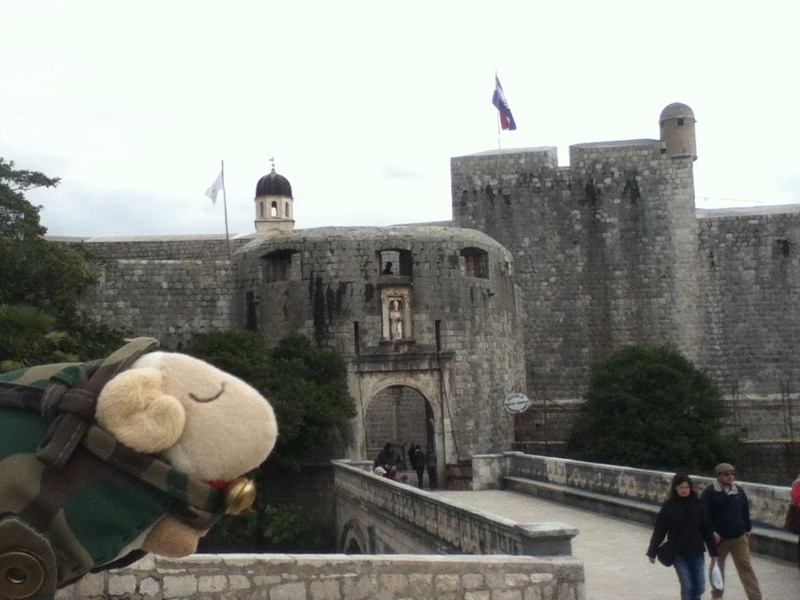 I could find another face of Dubrovnik! 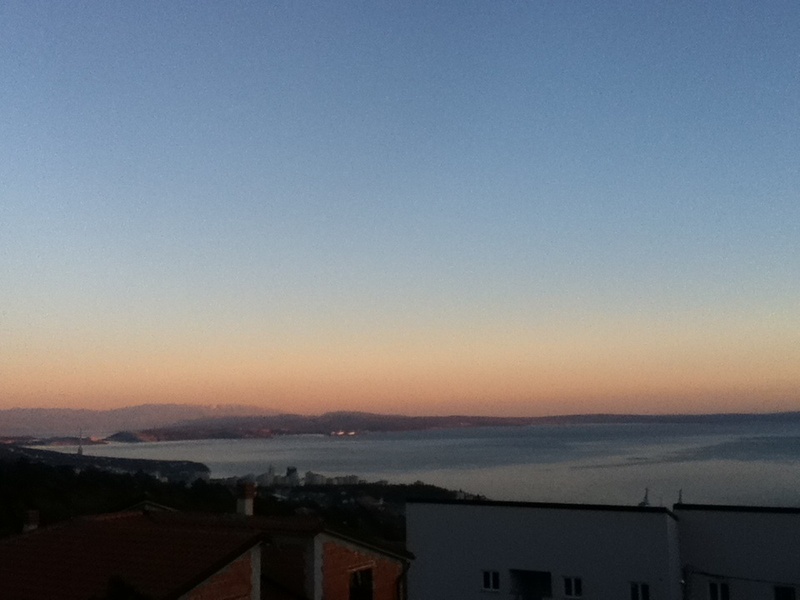 The view of the city with the sea, nice! This city is really beautiful. I entered into the city from other gate. It's a nice view! 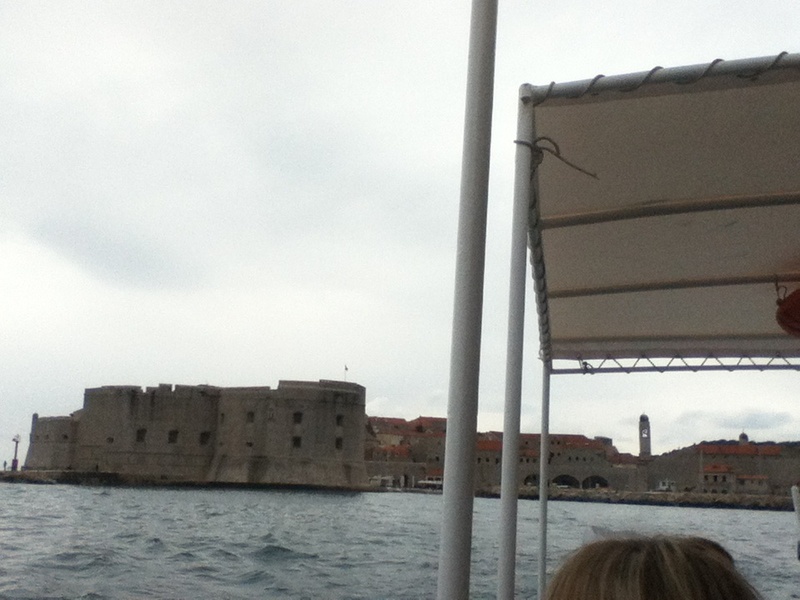 This is the entrance of the city from the sea. If we see the things from different angle, we will find new things! I saw some people walking on the city wall, so I found the entrance and went up. I could see the city from different angle. It's fun walking in this city. But there was a check point and I was asked to show a ticket... Ticket!?? Wasn't it free? I was told to buy a ticket at a booth down stairs, then I went to see the price. It was 90kns! (€12)! It was too expensive, so I gave up walking on the wall. Instead I will spend 75Kns (€10) for a boat ride! So I could see the city from the sea. 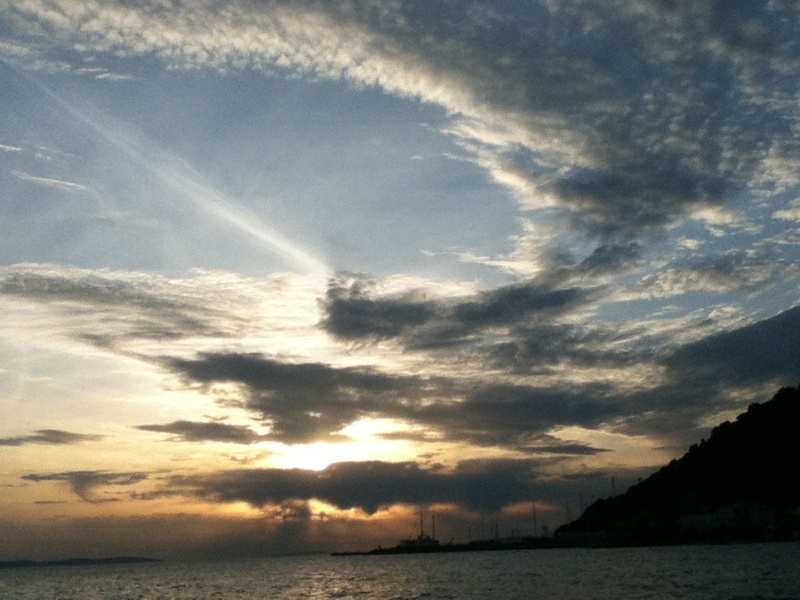 I liked the view from the sea. 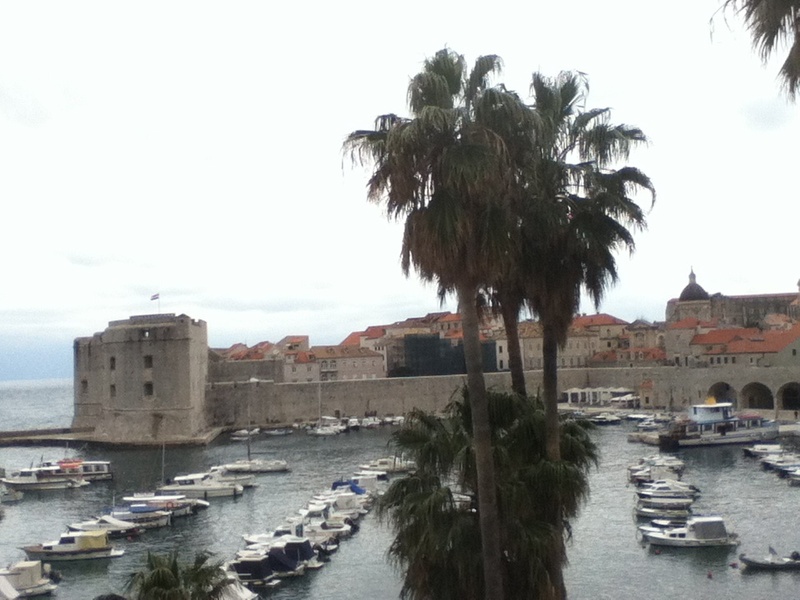 and came back to Dubrovnik. I could see how the city wall buoy on the rocks. The medieval era is really interesting. I went into the city again. Today I walked into alleys. This building was demolished by the attack by the Serbia-Montenegro army. It wasn't only here, the entire city was damaged. It connected with what I heard this morning. We know that all neighbours should be good to each other. But it is hard to achieve as we do remember what the neighbours had done to us or our ancestors. 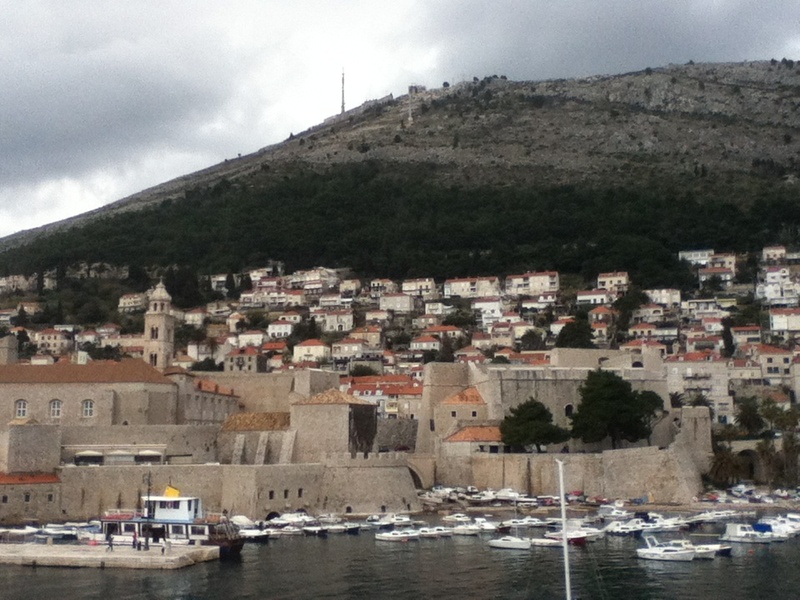 Dubrovnik is a popular tourist destination but it has a sad history. And people here are protecting their home with their lives. So for them, getting part of something, separating from something and so on, all of these are nonsense. 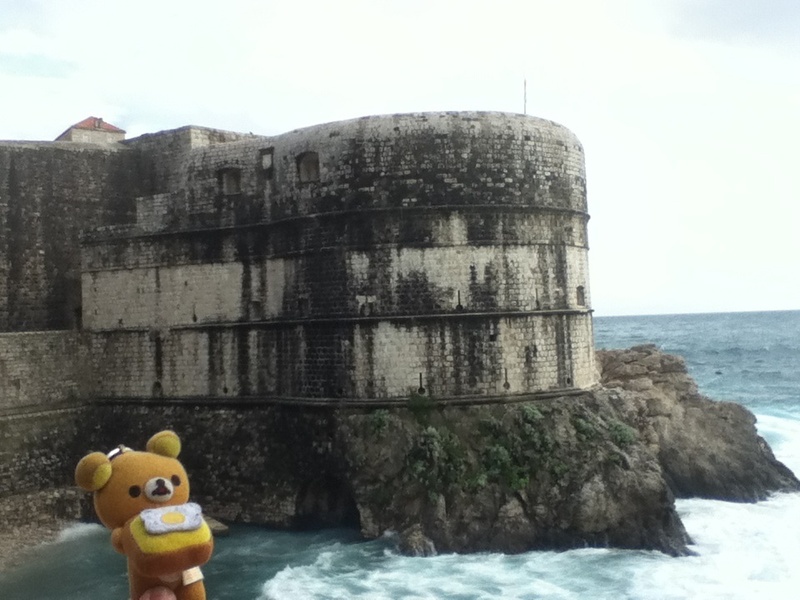 But Dubrovnik alone cannot go anywhere. It should go ahead with others. It's hard and difficult to keep / maintain pease and happiness. 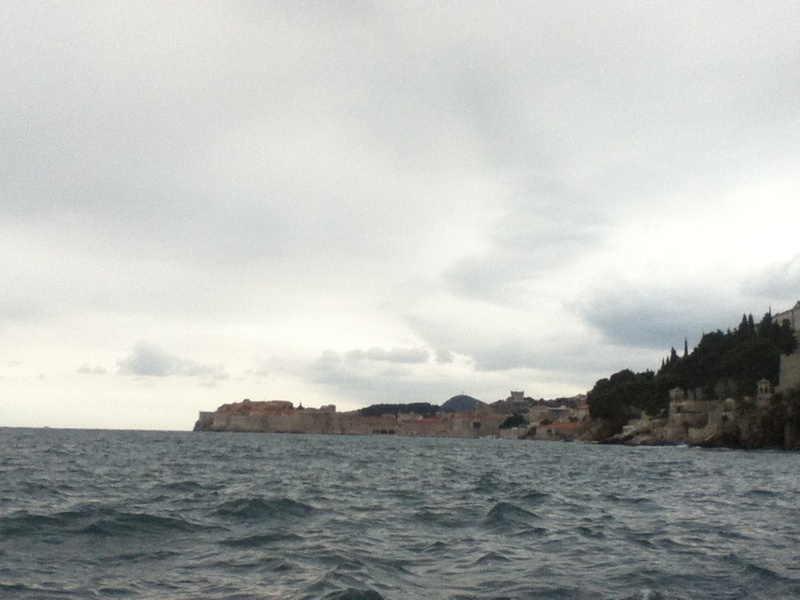 So Dubrovnik was whispering to me. It started to rain after 3pm. So I walked back to the hostel and made a plan for tomorrow. Well, I am still deciding where to sleep tomorrow. 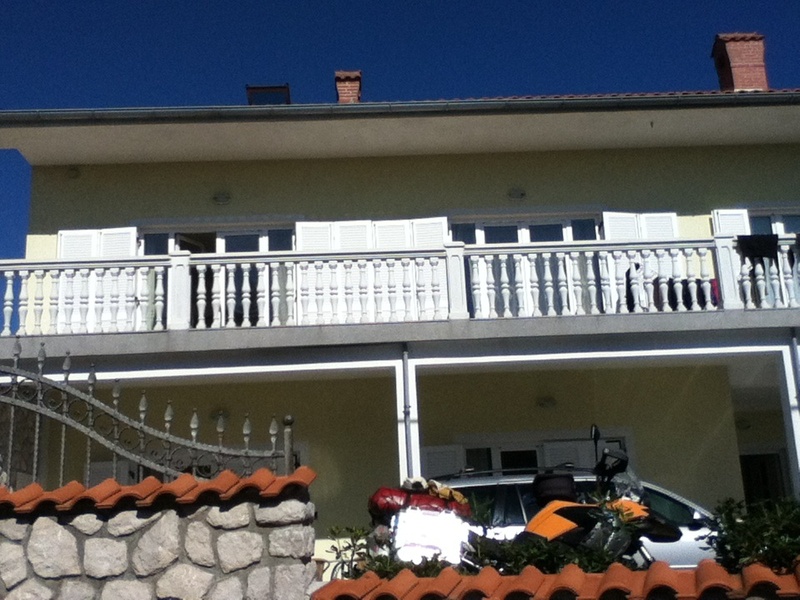 I'm going to Kotor, Montenegro for sure, but should I stay a night there or move forward. Well I decide that tomorrow, depending on my feelings. It's windy and the sea was rough again. 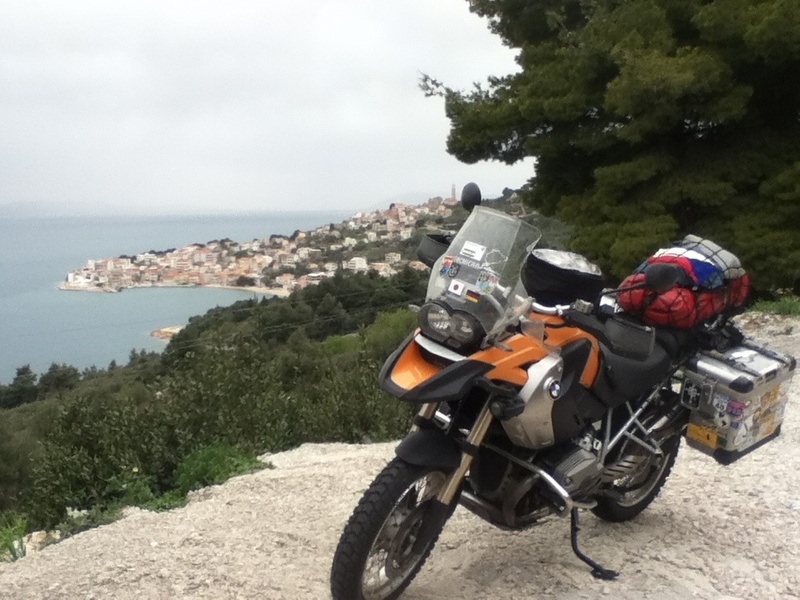 To Dubrovnik, I was riding on the coastal road. It was just 200km or so. 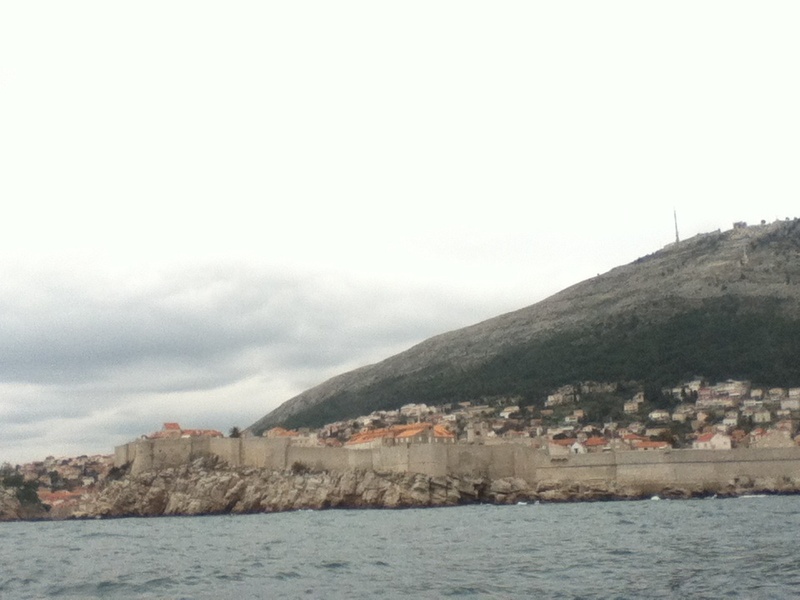 But in between there is a territory of Bosnia Hercegovina cutting off the state of Dubrovnik from the rest of Croatia. 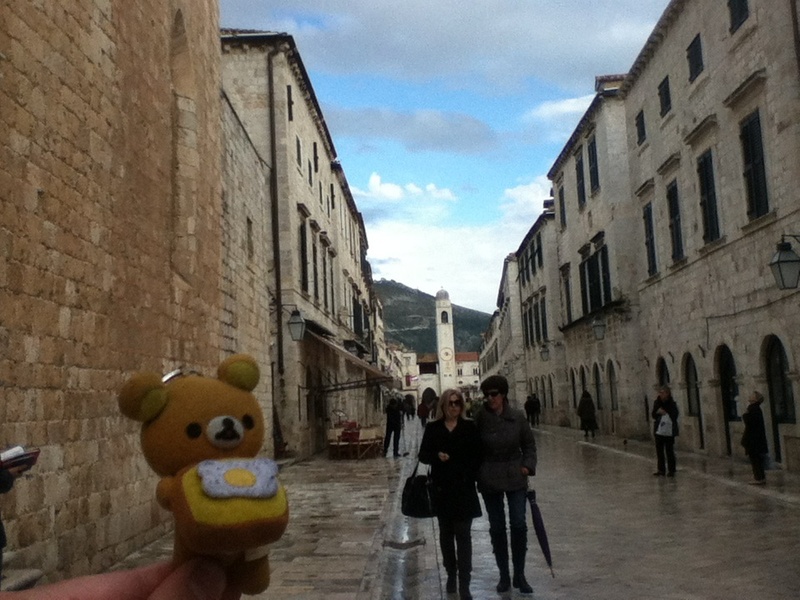 I guessed it would take 3 hours or so to Dubrovnik. It was raining and windy, so I did not make much photo stops and kept on riding. There were several places on roadworks, and it slowed me down. 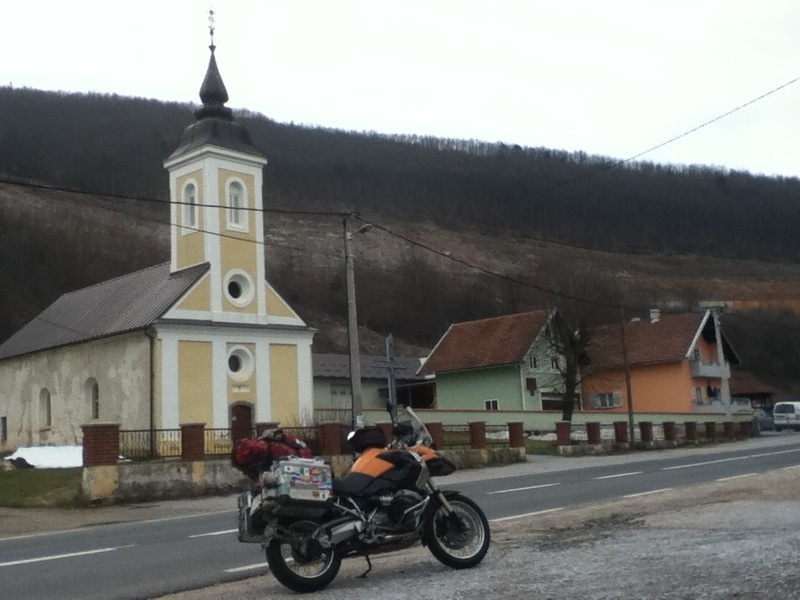 After 120km or so from Split, I came to the border to Bosnia. The rain got heavier and the wind got stronger here, so I wasn't happy to wait in the line. At Croatian side, the officer just checked my passport and did not even stamp on it. It was quick and easy. Then Bosnian side, I thought, but there wasn't any! I saw a new building complex was under construction, so in the future they will have more strict passport control, I imagine. 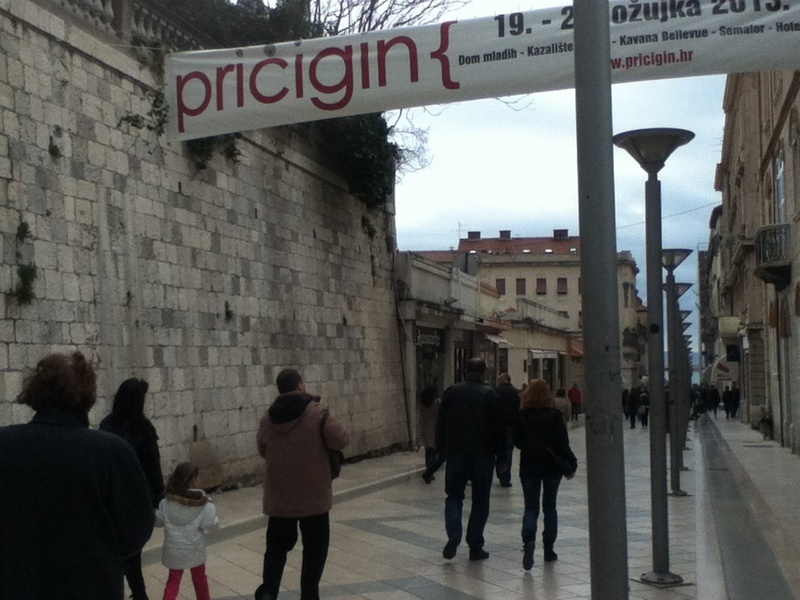 So I stepped on Bosnia Hercegovina, the 57th country to visit! Or should I count it??? 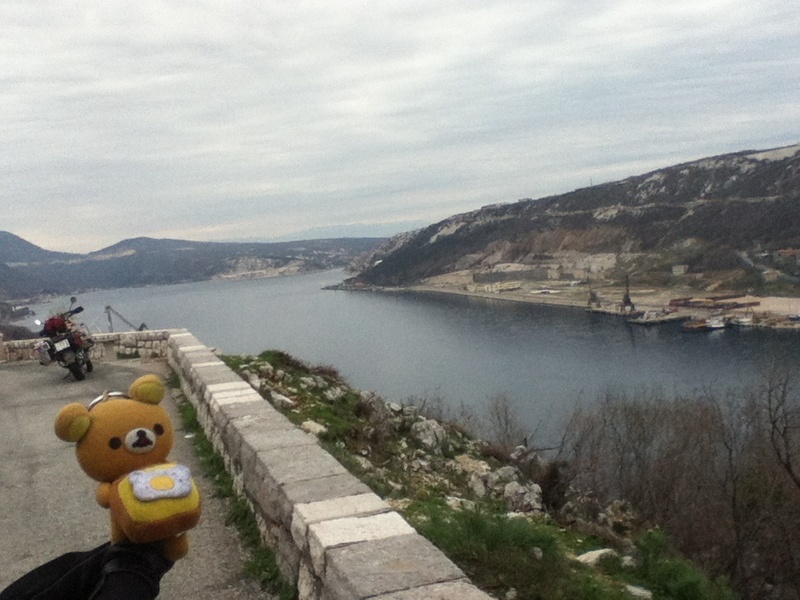 As the territory of Bosnia at Adriatic Sea spreads just for 13km, I stayed there only for 5 mins or so! The scenery did not change either. There was a small town, but it did not look special at all. As it was raining hard, I could not be bothered to make a photo stop. But it would be only country I would not take any photo...? I thought I should make a short stop. So this is the photo I took! Nothing special! 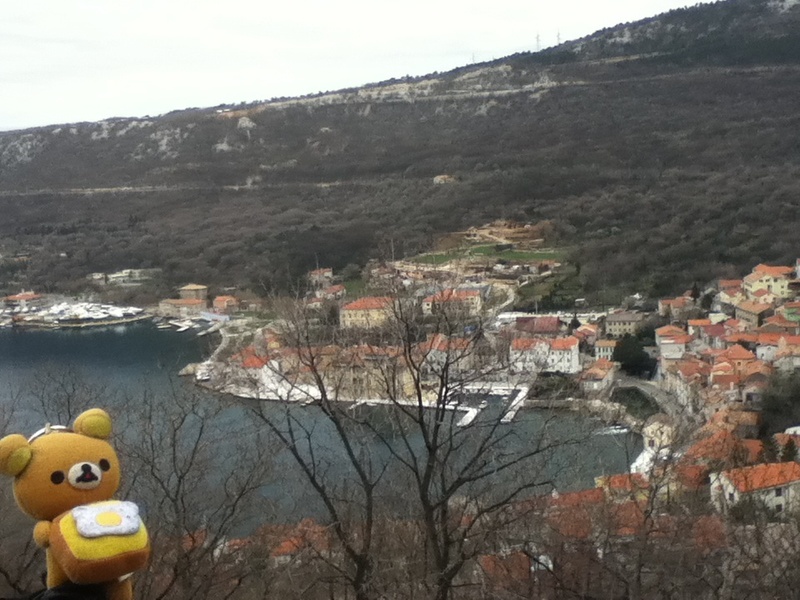 Then I came to the border to Croatia. There wasn't any control on Bosnian side, there were officers just at Croatian side. It was the easy entry. The officer just saw the photo page of my passport and let me in! I wondered if it had any meaning of having border facility there. Well, the easier the process, better for me it is. 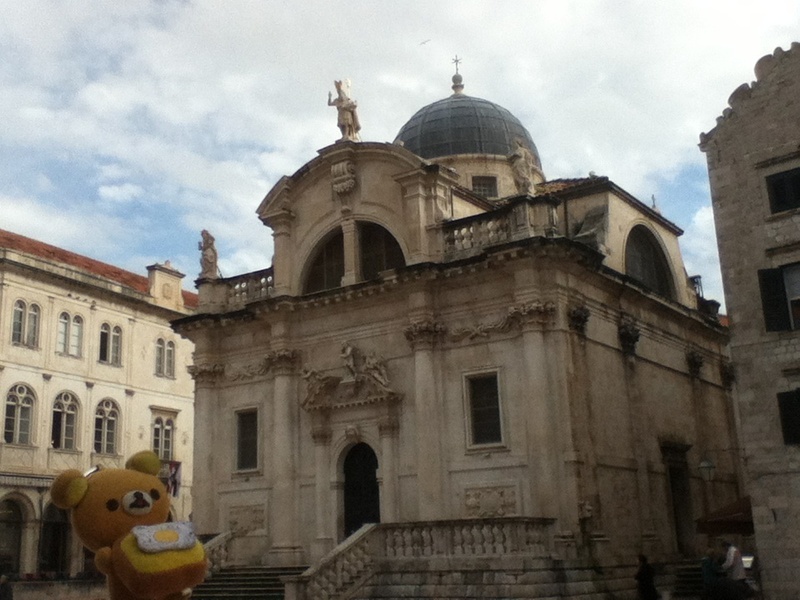 I got to Dubrovnik around 11:30am. I went straight to the hostel. Here also was still preparing for the season to come. So it was half open/closed. I saw another luggage in the room, so I thought I would have a company here. 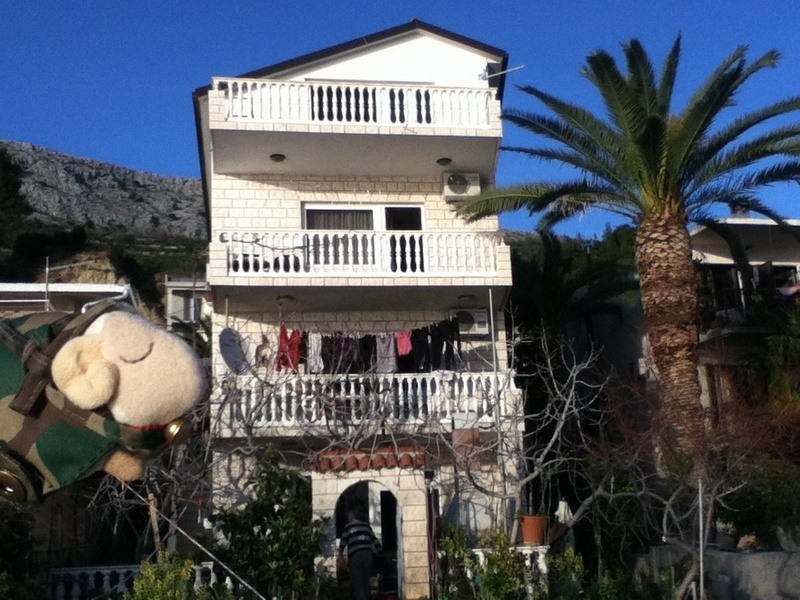 But the owner said "The girl is from Hong Kong and she is now in Montenegro, and will be back tomorrow or the day after." I was taking out luggages from Esperanza, then the thunder storm came! I put all the luggages in the room and was about to leave for a supermarket, another guest had arrived. And I saw he had a helmet! 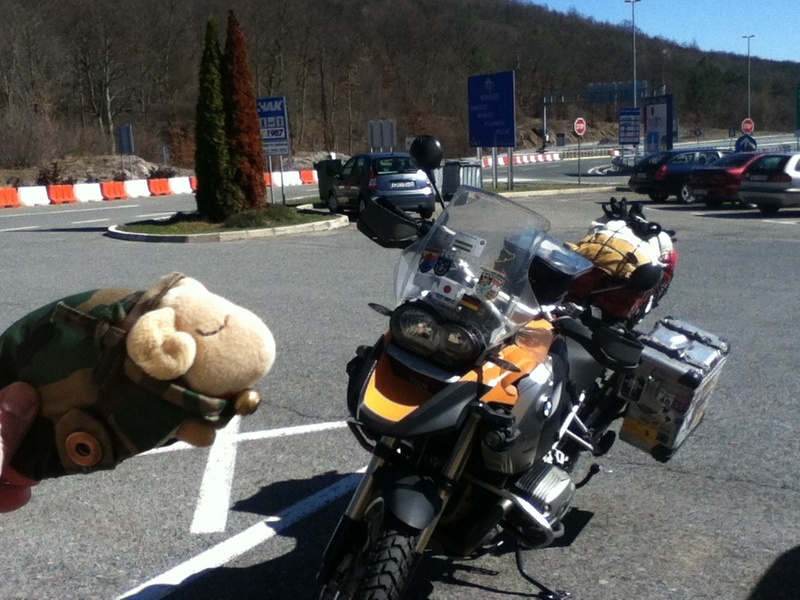 He was also a motorcyclist! He is Miguel from Portugal. 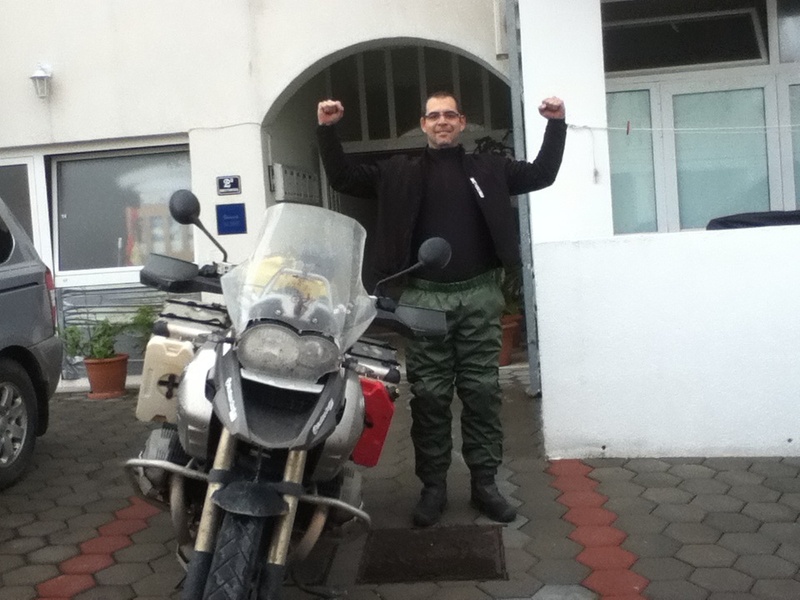 He started his trip from Andorra in Africa 5 months and half ago. While we were talking, the rain eased up, so we went to have lunch. After lunch we were chatting, and then we saw the sun coming out! 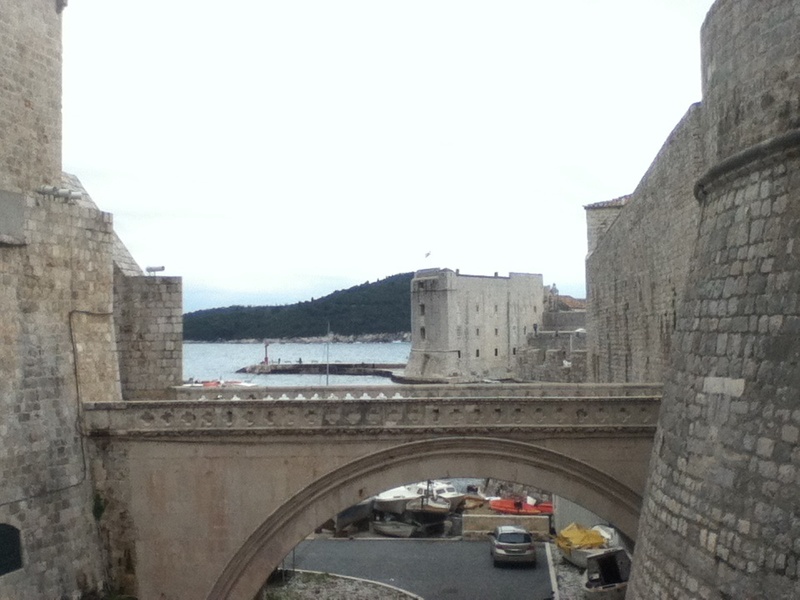 We should not miss this opportunity to see the old Dubrovnik! We took a bus there. 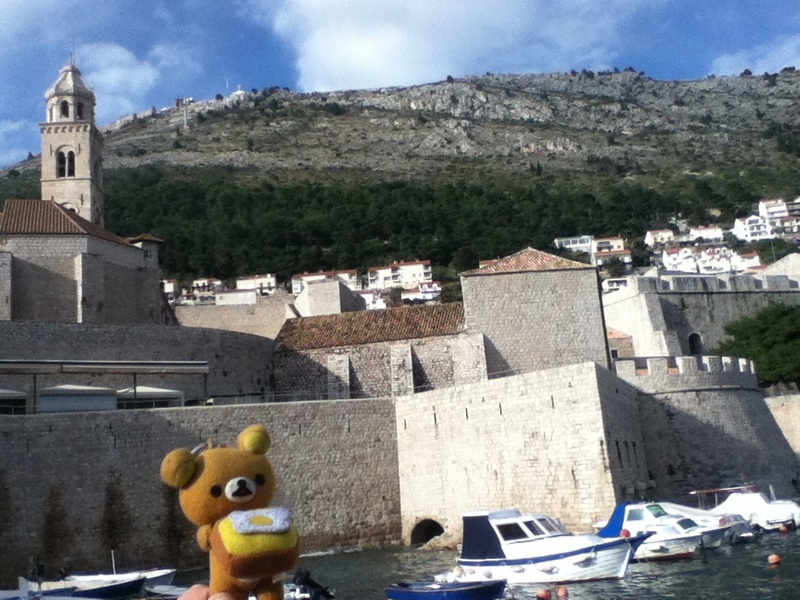 So here we are "Pearl of Adriatic Sea" Dubrovnik. 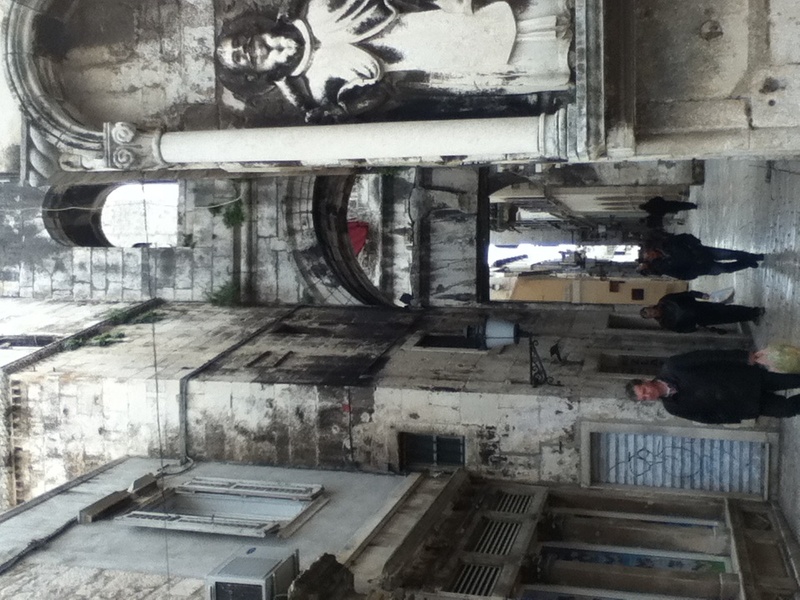 The medieval city is still kept intact and is still alive! The city wall surrounds the city. This type of city is rare in Japan (old Sakai in 15th to 16th centuries had a city wall protecting the city but later it was conquered by a lord, the wall was demolished). But it is common in Eurasia Continent to build a city in this way. 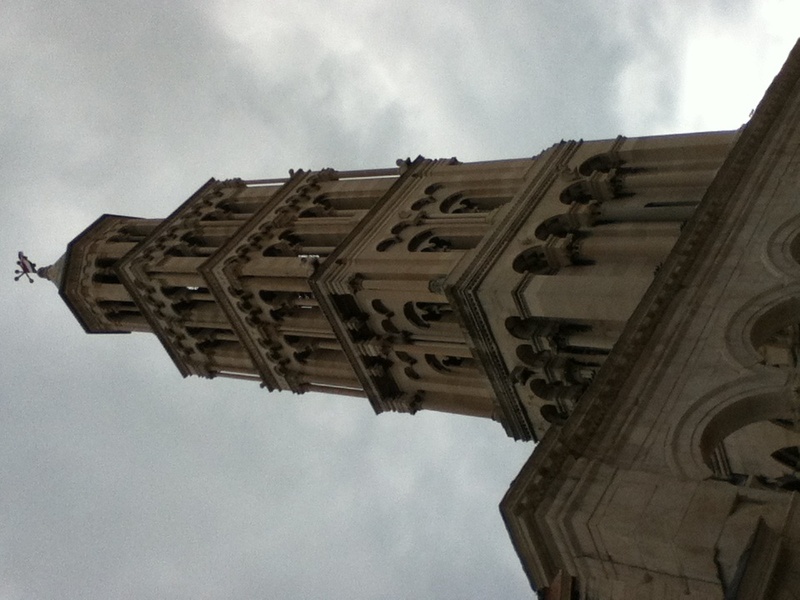 I visited Split yesterday but it has a different taste from Split. 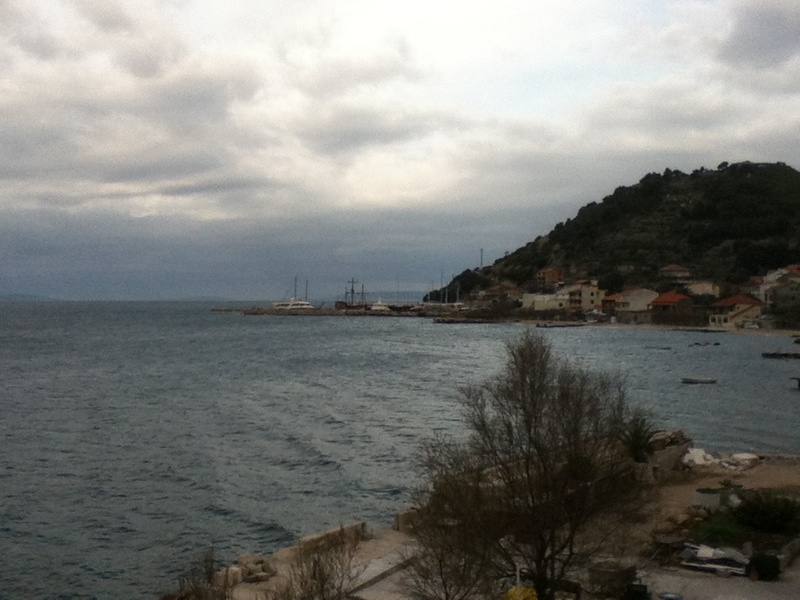 The view with Adriatic Sea makes it very charming. I understand why here is very popular tourist destination. I want to see the city from the sea. With Miguel, I walked around the city. We talked a lot too. After having enough walk, we sat down at a cafe, then after while it started to rain again. We were lucky to see the city while it was sunny. Back to the hostel, we had dinner and continued our conversation. Miguel is heading to Split tomorrow. I will stay one more day here. It was windy and the sea was rough. Well, it's better than raining. 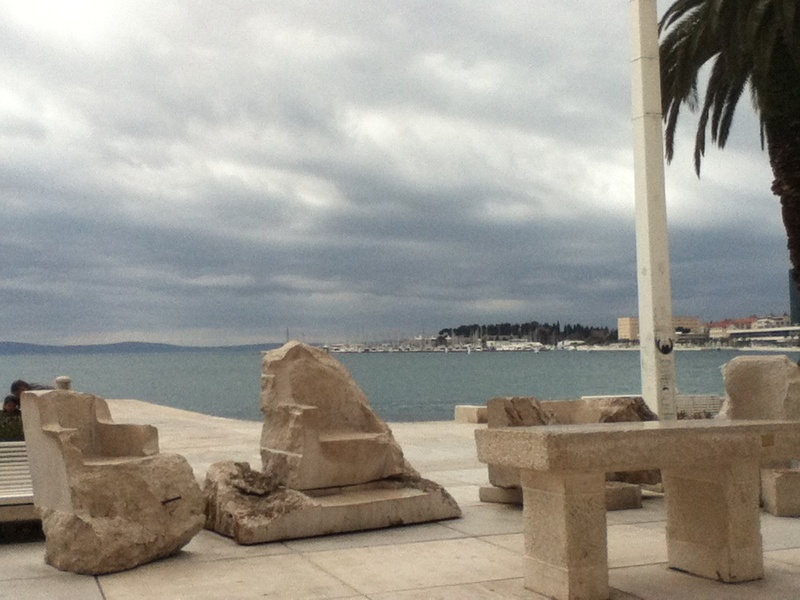 I caught a bus to the city of Split. It cost 17 Kunas (€2.50), that's little expensive. 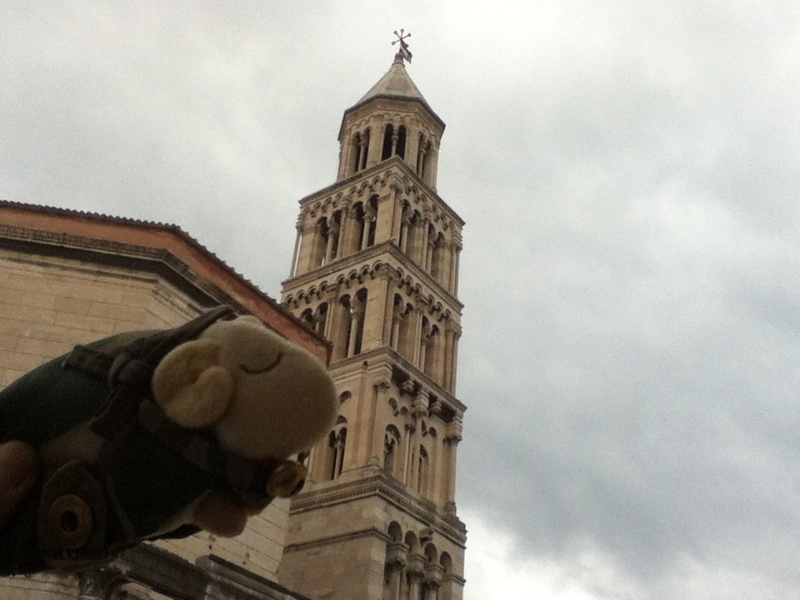 Split is a fairly large city. 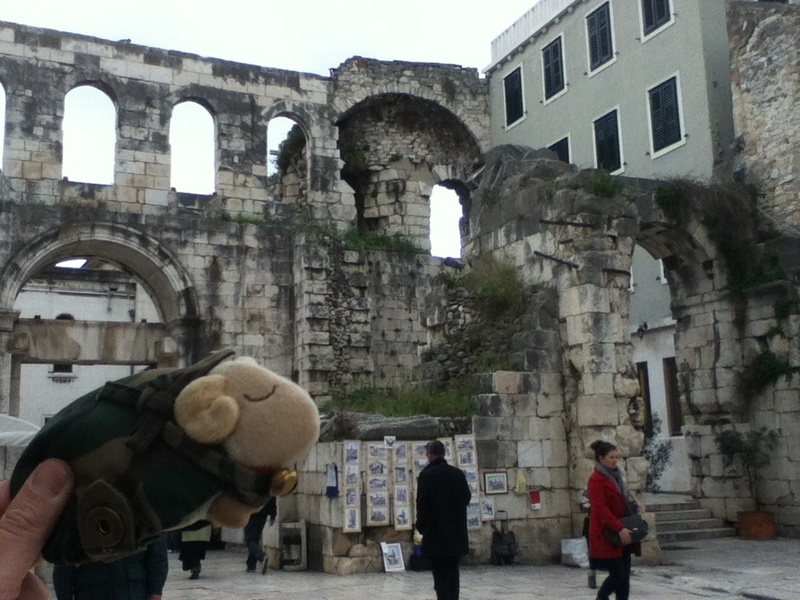 I wanted to get to the historic area of Split. 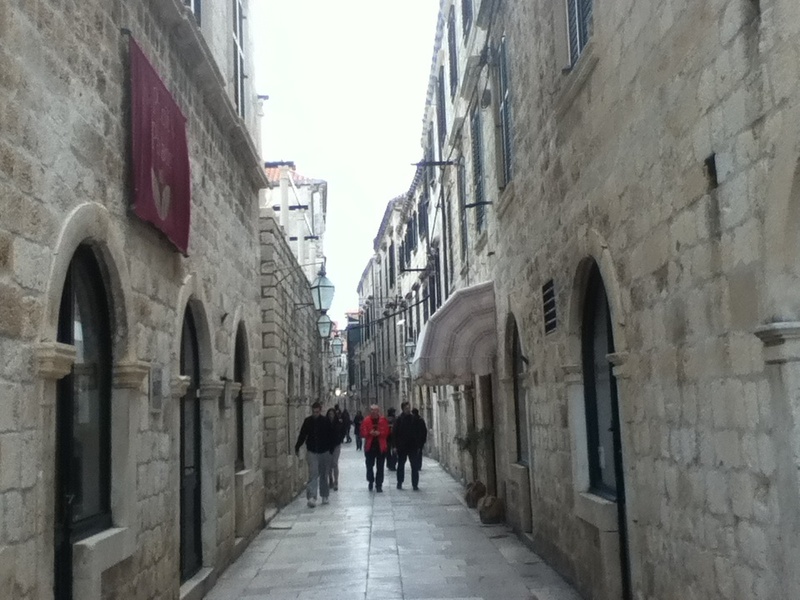 I was heading to Diocletian Palace. 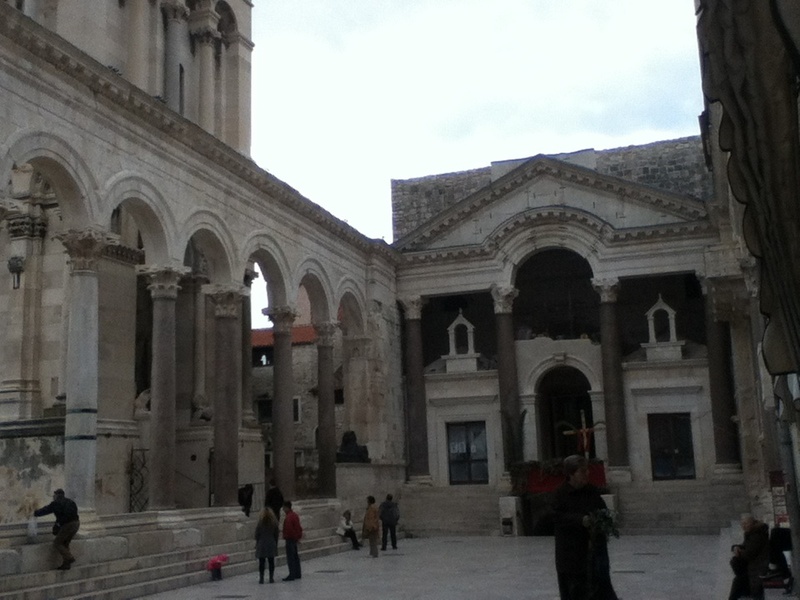 The Roman Emperor Diocletian built his retirement palace here. I got off the bus and walked to the old town. 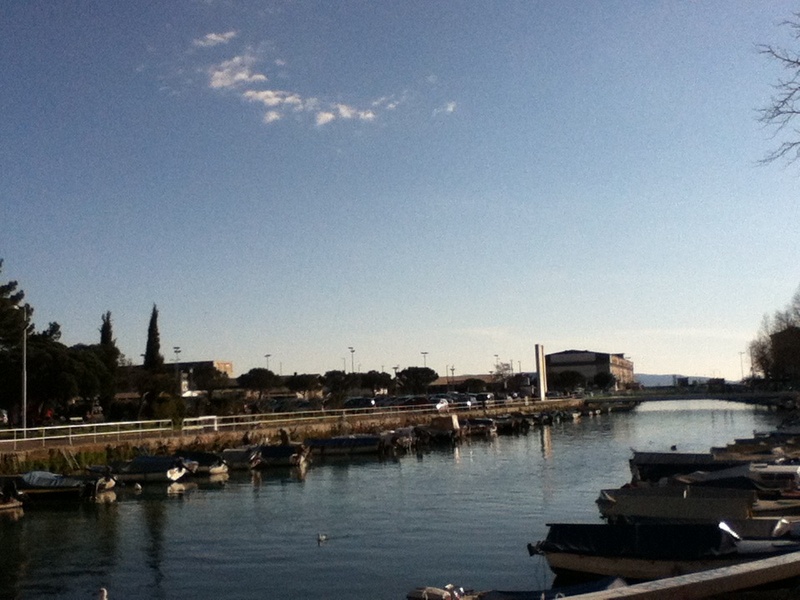 I kept walking and I came to the harbour. Where were the Roman ruins? It's supposed to be the World Historic Heritage. I turned into an alley. Then it looked more like a ruin! 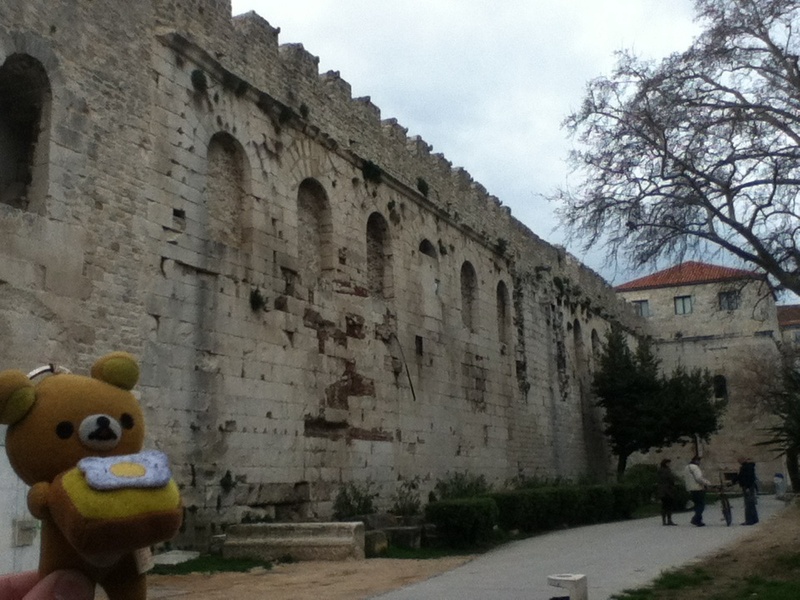 The city wall looked like a "Roman" architecture. 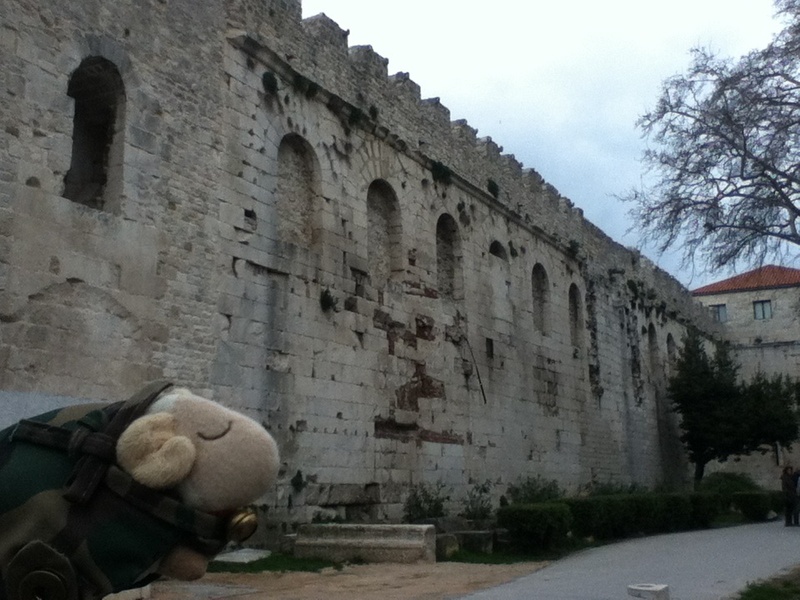 Mr. Sheep has seen so many Roman ruins. But for the bear it was the first time. I saw a group of Japanese tourists! I was amazed to see them here. Well, it was probably a tour going around the World Heritages. This bell town was built in the medieval. It was a church and as it was Sunday the mass was going on. Gospel could be heard outside of the church. It sounded different from ones I knew. I wondered if it was influenced by the Eastern church. 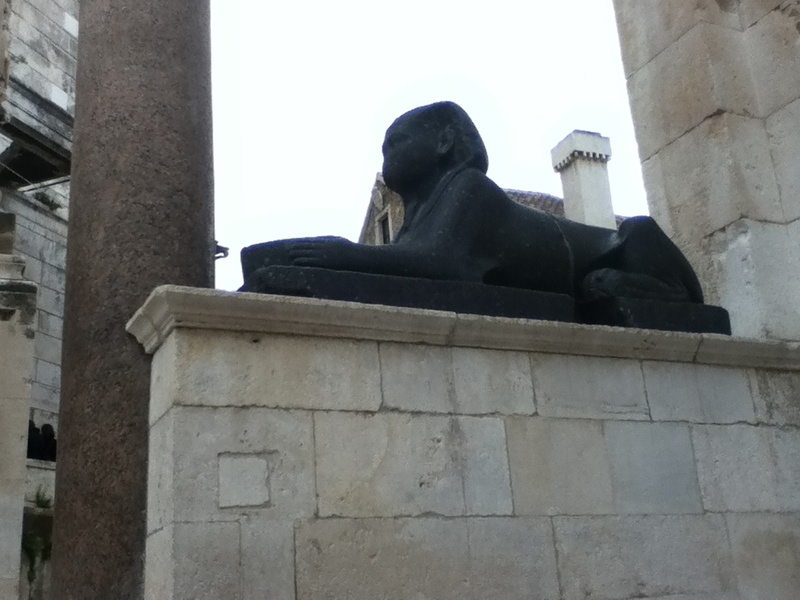 There was a sphinx! Romans loved Egyptian arts and mythology. I liked the way the buildings were ruined. I guessed those were Romans. "The Golden Gate". It is at the eastern side of the palace and believed to be the main entrance to the palace. 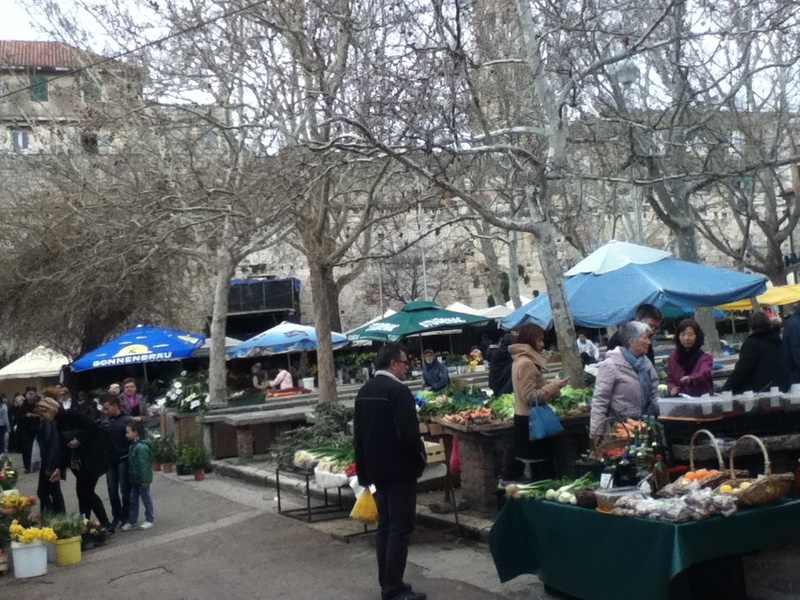 Outside of the gate, there was a market. I bought some breads and kept walking around while having them. There was a basement I could explore. The entrance was 40 Kunas (€6). It's little expensive but I went in. 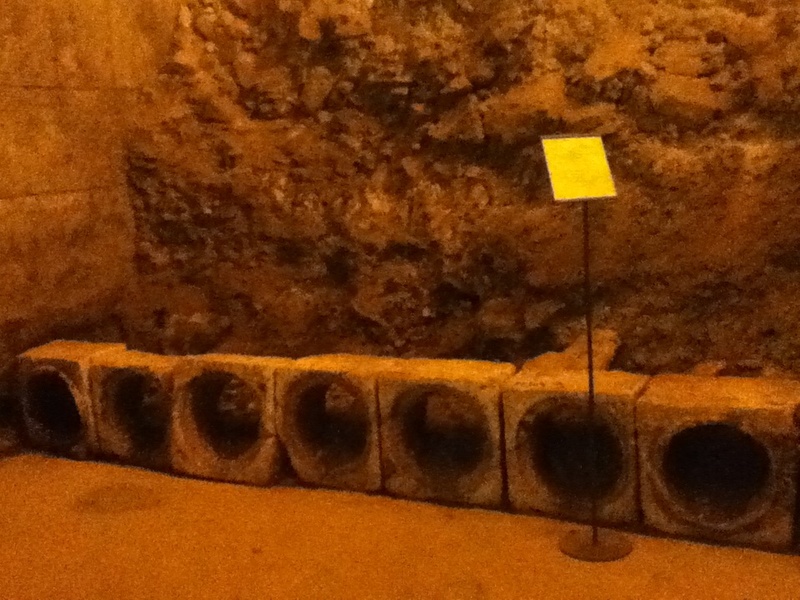 Those are remains of the ancient sewage system. 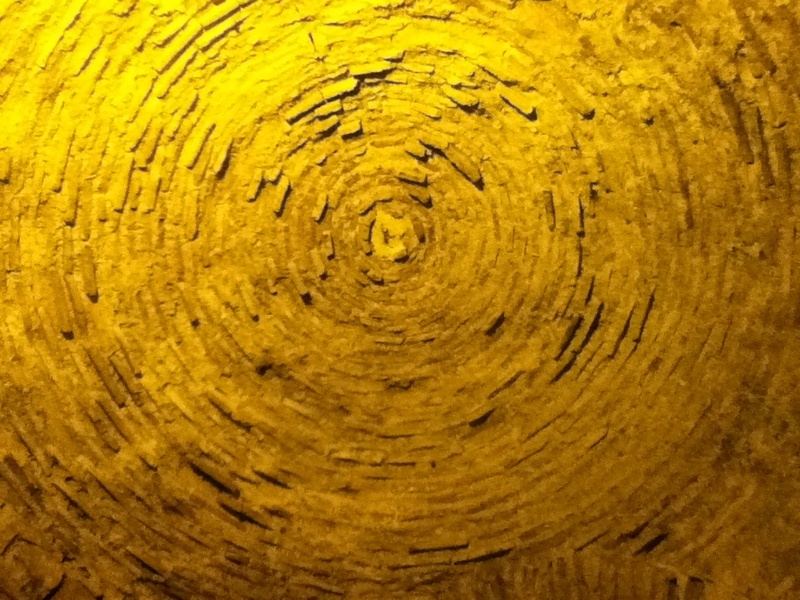 A dome ceiling made by bricks. 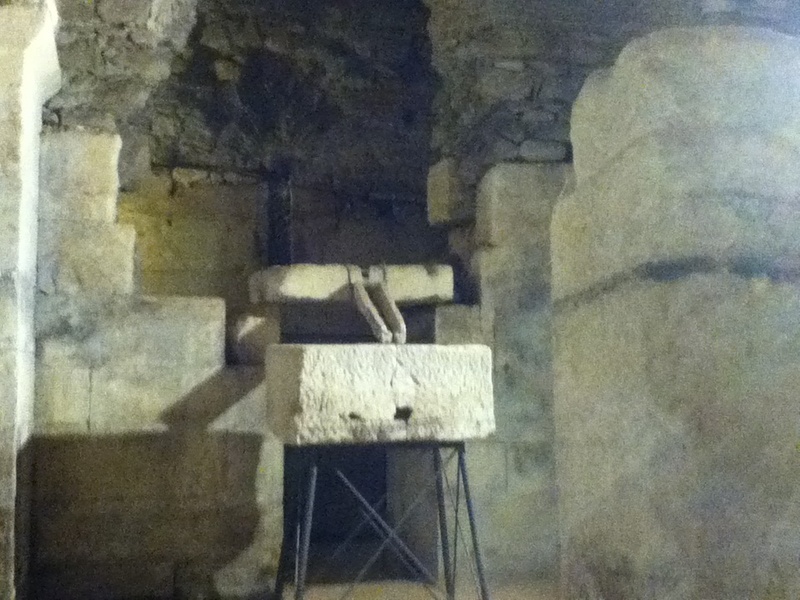 The ancient olive oil extractor. 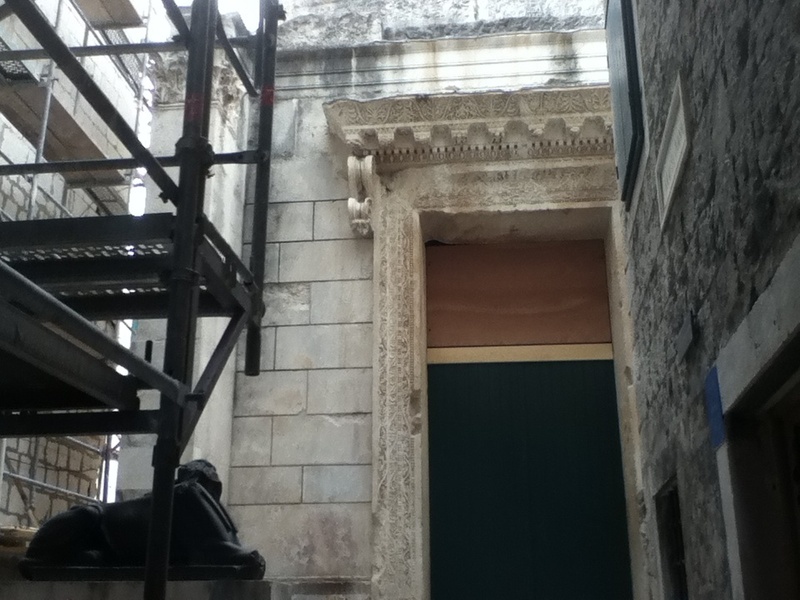 Here has the temple of Jupiter, it is special for its original ceiling. It is rare to have the original ceiling kept for so many years. This is the World Heritage site, but people are still living!!! The city is still alive. That was a surprise. 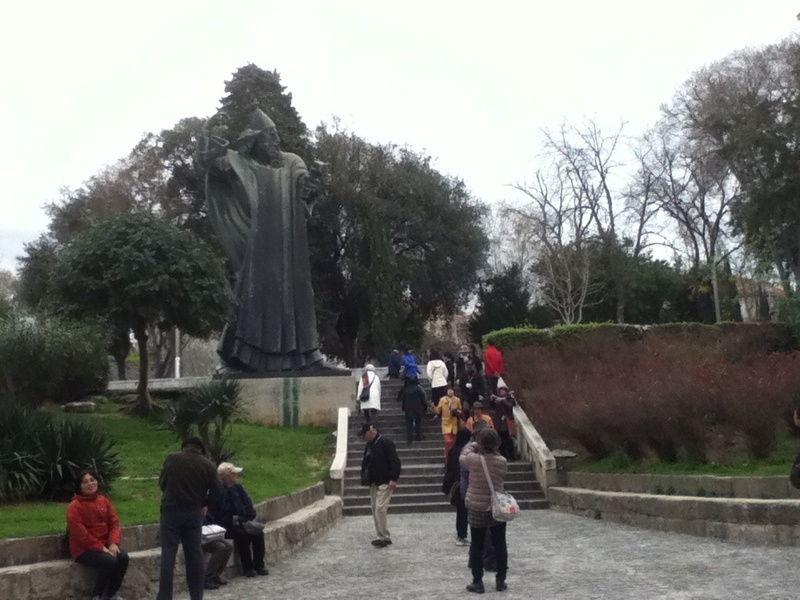 I enjoyed exploring here even though it was very touristic. I had enough walk for a day. I took a bus back to the hostel. The sun came out but it was still windy. Luckily I could see a nice sunset from the balcony! According to the forecast, it will rain tomorrow. 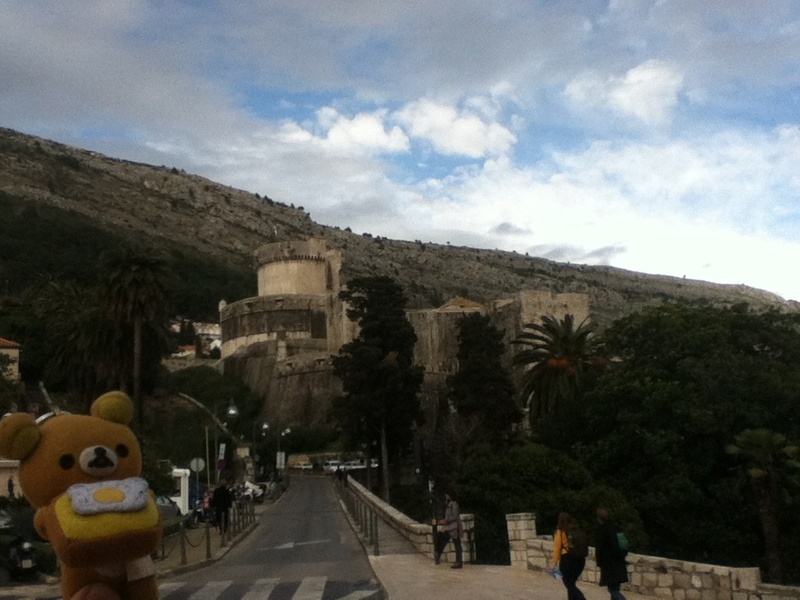 I'm thinking to get to Dubrovnik, but somehow it is separated by Bosnia for 13km or so. I have to cross the border. I hope it will be the easy crossing. It's cloudy. But the air temp was around 8℃, so it was not that cold. Recently I was too hurry riding down south and used the motorways, so today I took the local roads. 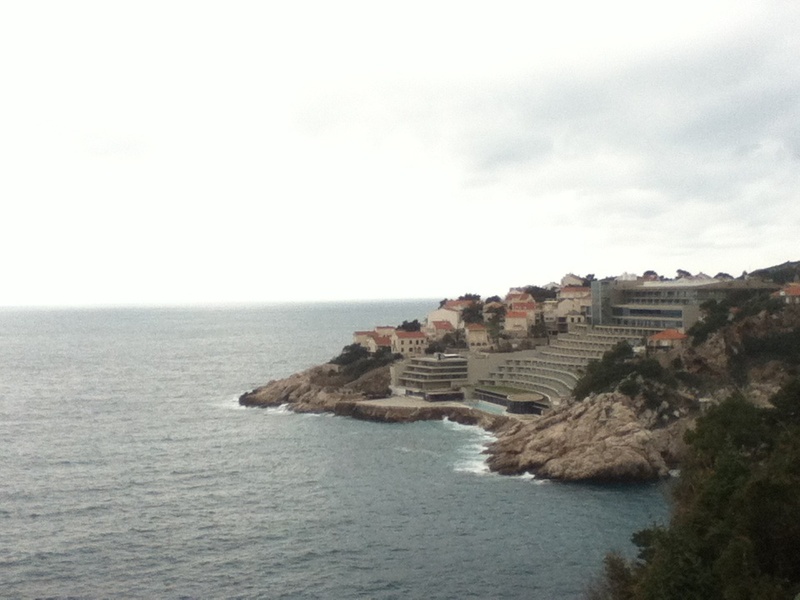 The land scape of Croatia at Adriatic Sea is very interesting. Those Ricky hills rise up just from the sea shores. 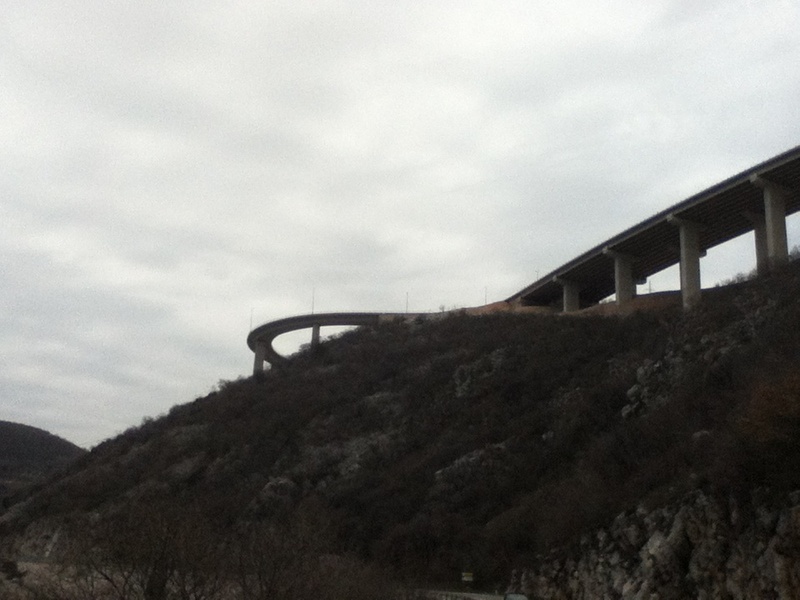 The road goes through those places, so there are lots of curves! I enjoyed riding through the curves! Those sceneries I could see while riding were quite good. Unfortunately, there weren't much place to pull over, so I could not take much photos. This one reminds me of fjords in Norway. The bay is narrow and deep, then a settlement is located at the end of the bay. The road is built like that! If there is an earthquake, everything will come to fall!?? I rode along side of the coast and then went inland. The altitude rose pretty quickly and I started to see some snow remaining on the road side above 600m high. The air temp dropped to 4℃! It was cold! There were some villages along the way. I reckon the main industry here is farming, but in winter time it would be too cold to make anything. The altitude got higher and at around 800m high, the fields were covered by snow entirely still. The air temp went down to 2℃! I had to ride in the plateau for a while. 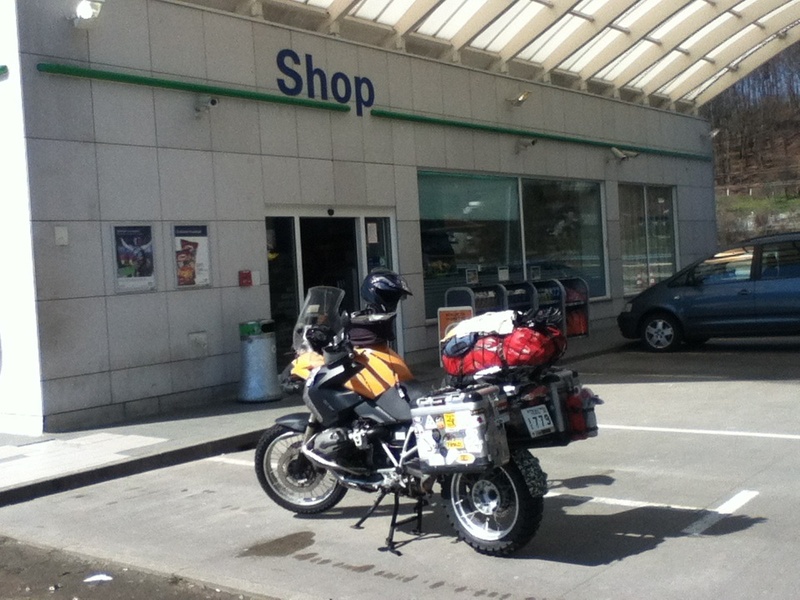 I made a few stops at a petrol station and a supermarket for lunch. Finally, I came to descending! As I came down, it got warmer! And it was getting sunny! But, but, my GPS started to behave funny around here. It was connected to the power and the charger was just purchased 2 days ago and it's the Garmin genuine one. If I took off the charger and used it with the internal battery, it worked fine. I wondered what was wrong. The way to Split was very clear without the GPS, so I kept riding. 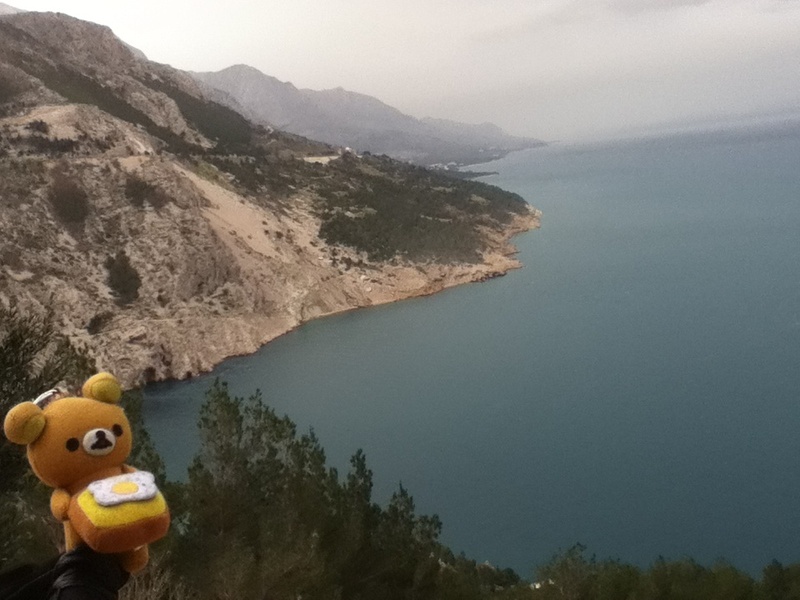 Just before Split, I came down from the mountains and met Adriatic Sea again! I passed the city and continued to the east. 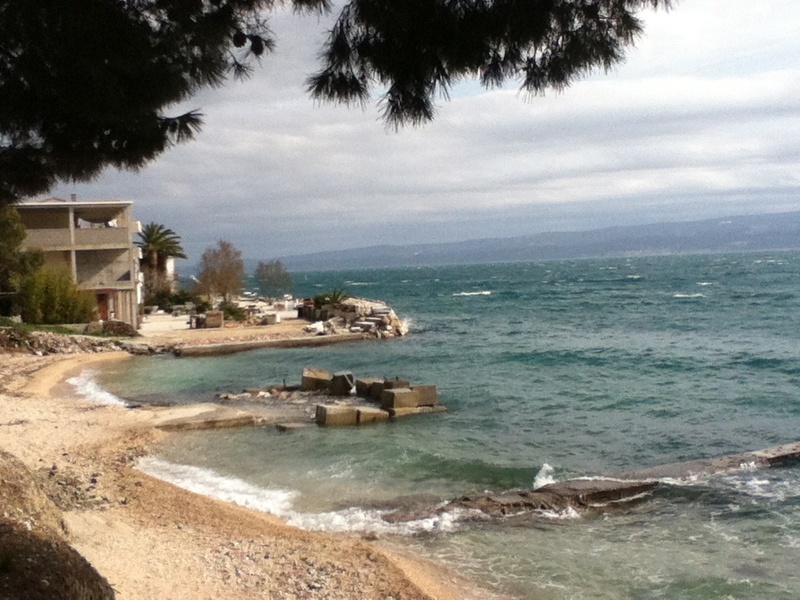 Today's accommodation "Hostel Adria" is located in a small town called "Jesnice" at the east of Split city. I was riding along the shore and the scenery was so beautiful. I went passed many times. I asked people but still no success. Finally I came back to the origin. I trusted the GPS location. I pulled over and looking around the place. Then a gentleman told me "There is the hostel!" It did not have any sign and the street number was different from the address shown on the web!? No wonder I could not find it by myself. The hostel has a proper garage and I parked Esperanza securely there. It was worth finding this hostel as it is in front of the sea! A nice setting indeed! It's in off season (of course), and the owner couple did not expect any guest, so the room was not ready... I made a booking on the web though. Well, it doesn't matter! It reminded me of Latin America. 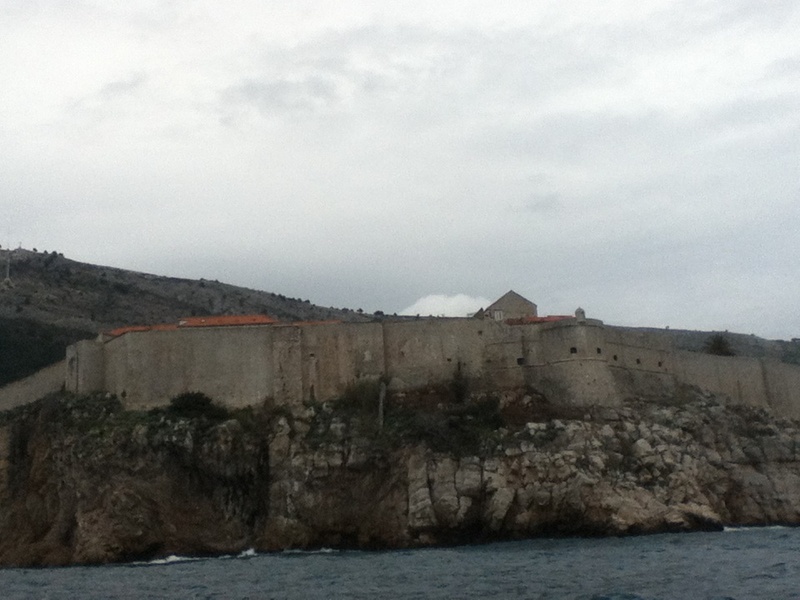 Well here is Darmatia - the former colony of Roman Empire. So people here probably have some Latin DNA!? The hostel itself seems nice too. I was waiting for the room done seeing the sea. The sun was setting into the sea. I have the sea view by myself from the room balcony! Of course, there is no other guest, so I can use the room just for myself. There is no shop around the hostel (again!) I had to walk quite a bit to get to a shop. The shop was small and they did not have much selections. Otherwise, it's a good place to stay. 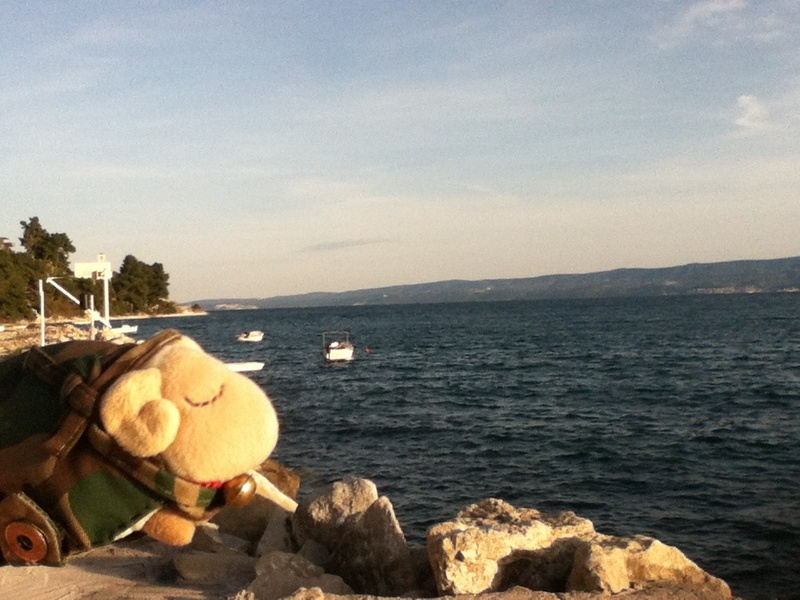 Well, tomorrow I will go to the city of Split and do some sightseeing. 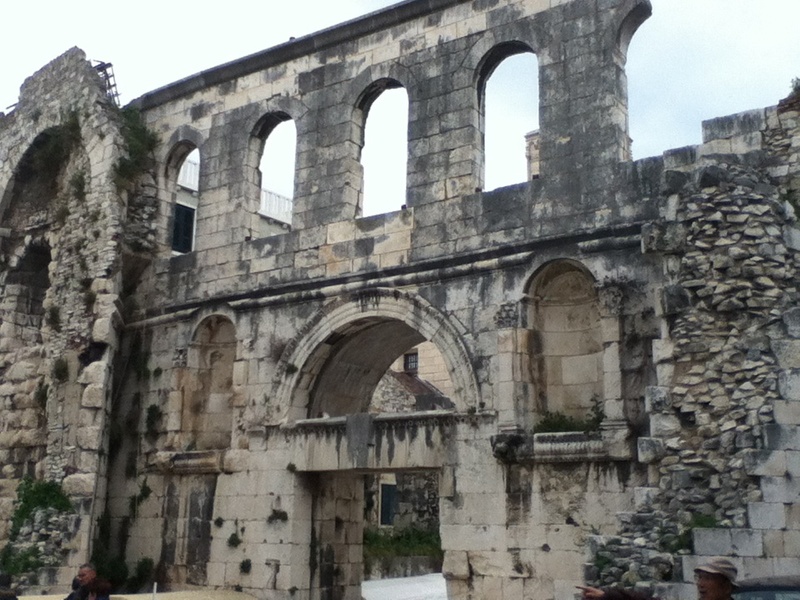 There is Diocletian Palace in the city (it was the origin of the city). The first Roman Emperor who retired from his throne before his death. He made his retirement palace on Split. Very interesting! It's a fine day from the morning! I wanted to stay here one more day but I'd better go south while the weather is good. It's expected to snow on Sunday. It's operated by a luxury hotel and it is next to the hotel. 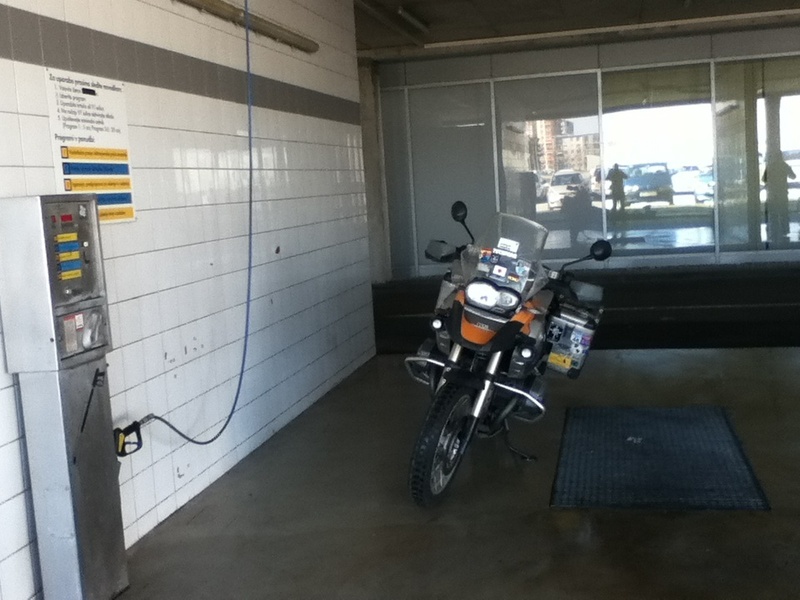 With some coins, the pressured water came out from the nozzle and I could wash Esperanza with my hands! I got rid of salt stuck on her. Now she was saved from corrosion by salt. It's 10am. 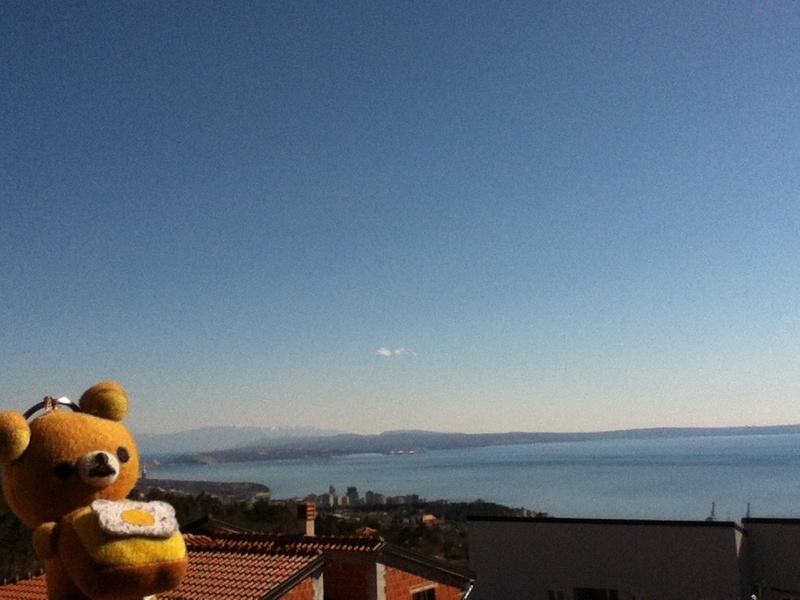 I headed to today's destination Rijeka, Croatia. 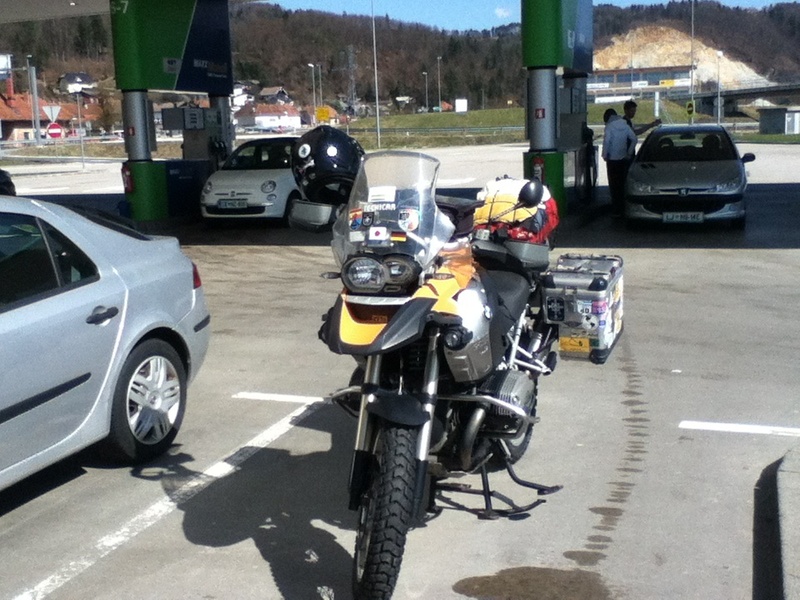 I took the motorway to the capital Ljubljana. Once outside of the city, the farms and fields extends. 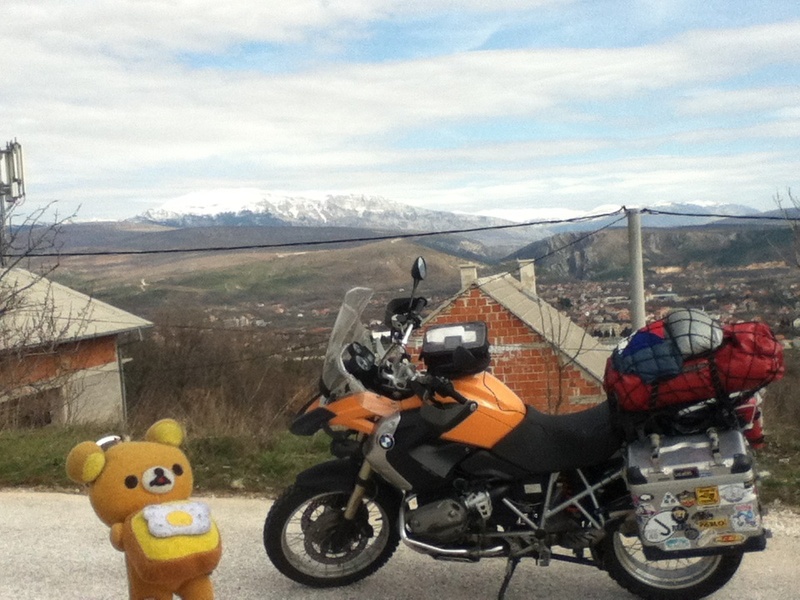 I could see the snow mountains on the distance and it was a pleasant ride. Slovenia is fairly a small country. If I take a motorway, I can pass through the country in no time. On the motorway, only when I stop at petrol stations I have some interactions with people. 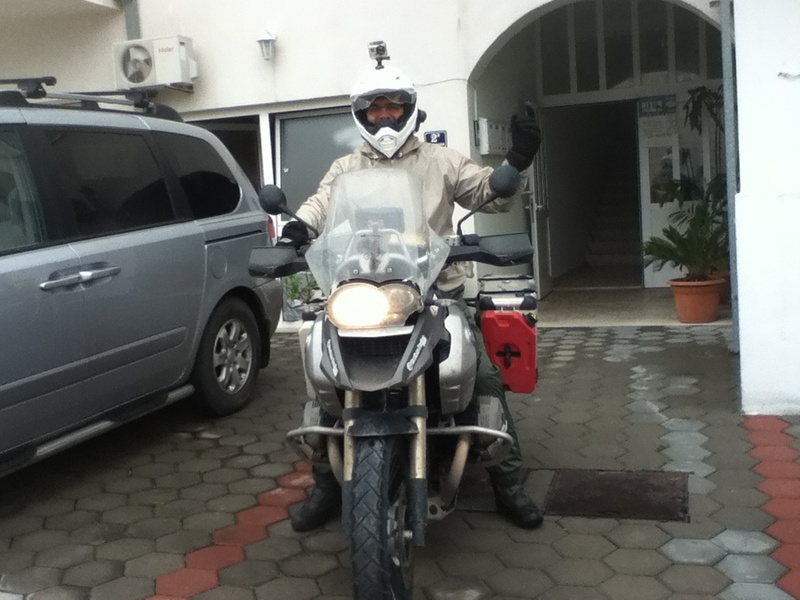 I put Esperanza on the centre stand and checked the engine oil level. No problem! 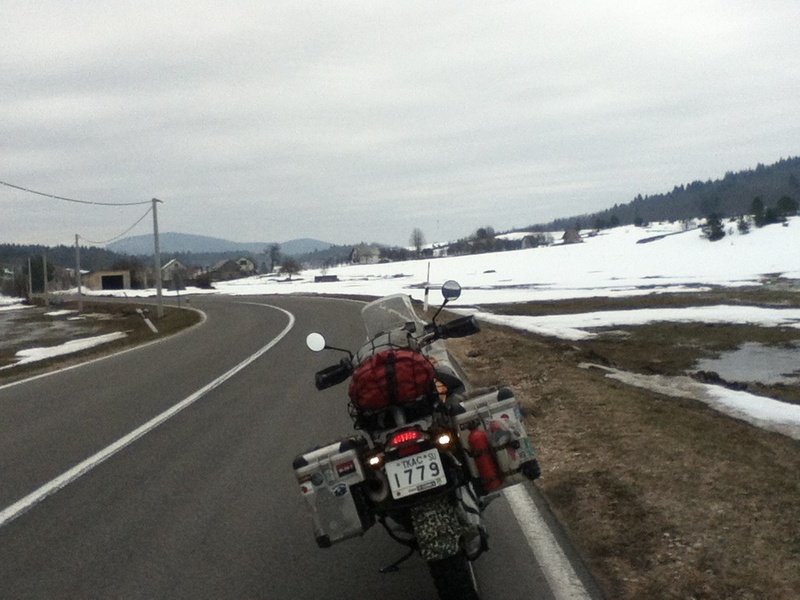 Fortunately, there was no motorway from Ljubljana to Croatia. So I was riding on the local roads. 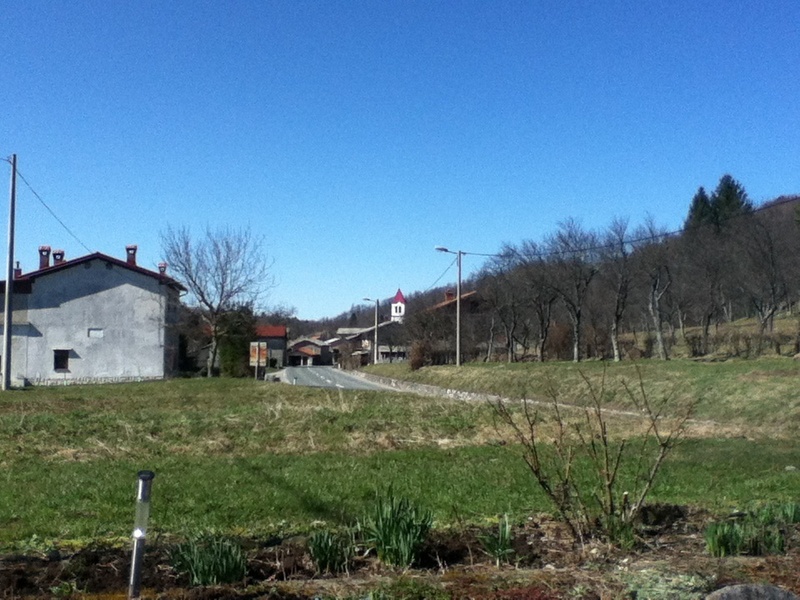 I rode through curves and passing by those villages along side of the road. Beside the road, there was a creek running. A nice country scenery. 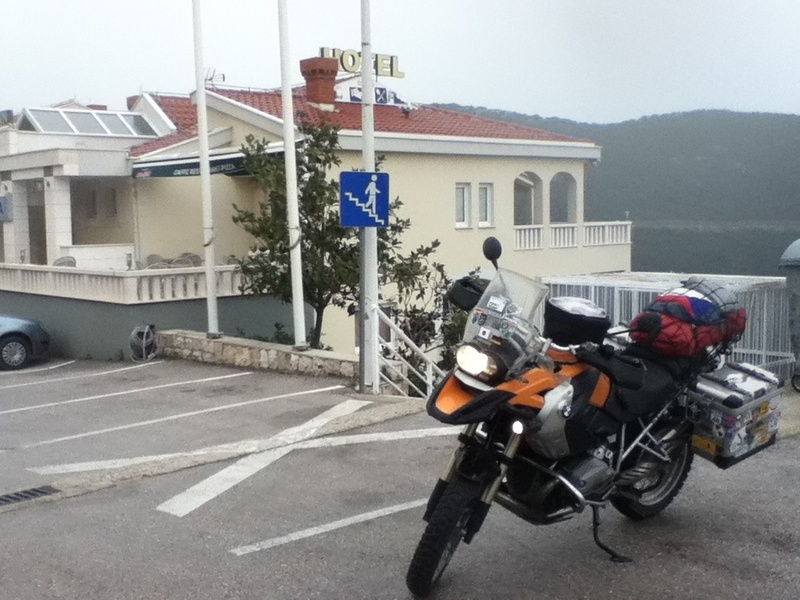 Just before the border, I made a short stop for exchanging Euros to Croatia Kunas. The rate was around €1 = 7.5 Kunas. Then I came to the border. It's been a while since I crossed the real border with Esperanza. 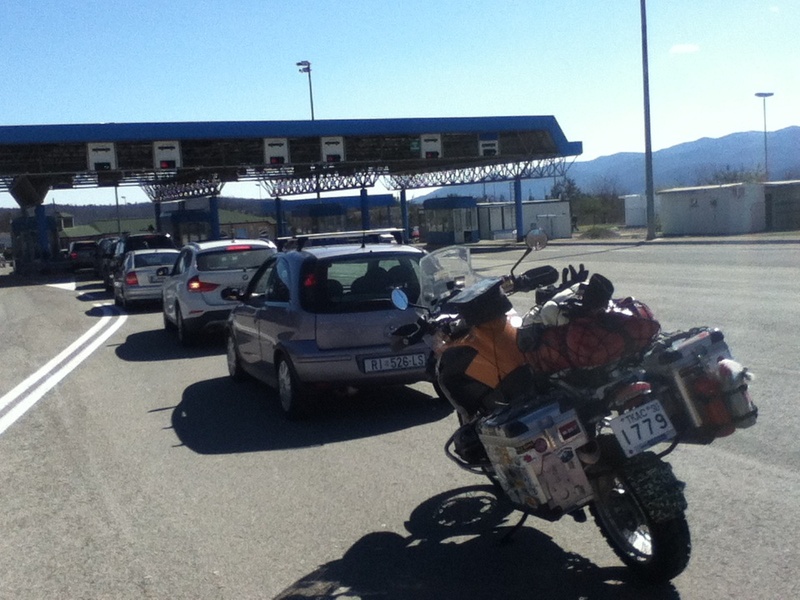 Croatia is not a part of Schengen Treaty, so the border crossing requires a proper passport control. 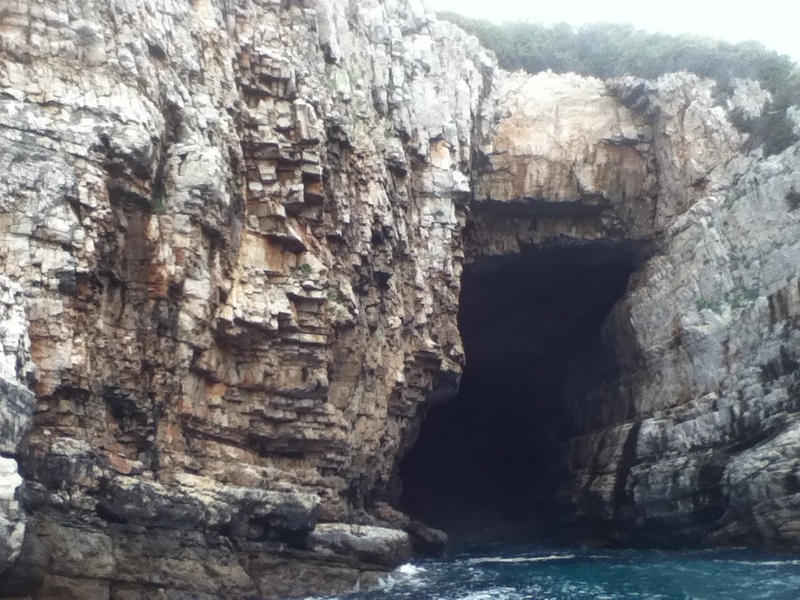 Then I entered Croatia. The officer asked me where I was heading and stamped my passport! Easy. It's the 56th country to visit. 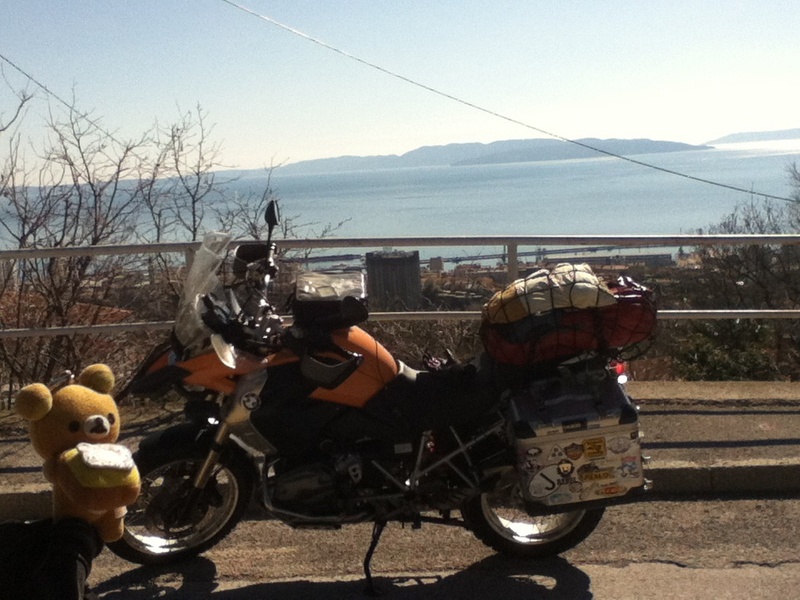 I rode on the motorway for a short time, and I saw a sea! 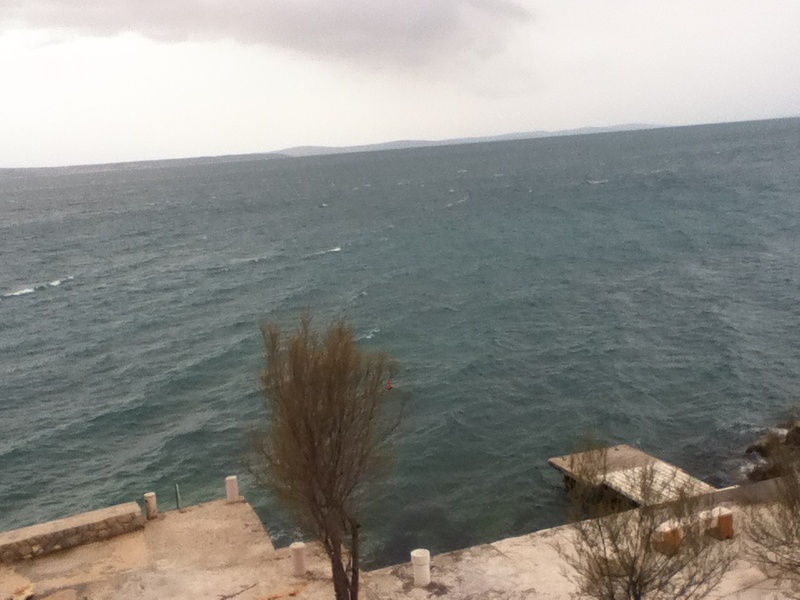 Adriatic Sea it was! 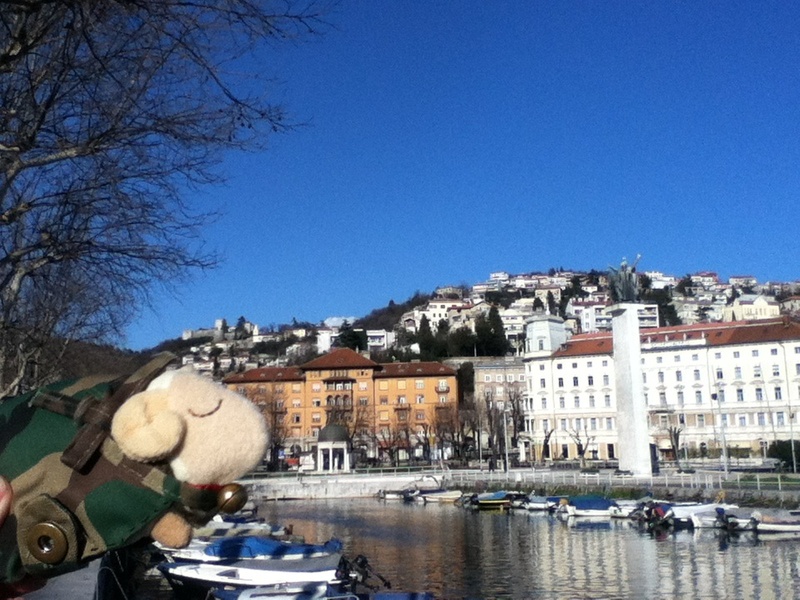 Rijeka is located near the border to Slovenia and Italy. I got there by 1:30pm. The apartment I booked for today was on the top of the hill. I rode up the hill from the coast. From the hill the view of Adriatic Sea was excellent. This is "Apartment Luana". A private room costs €24. 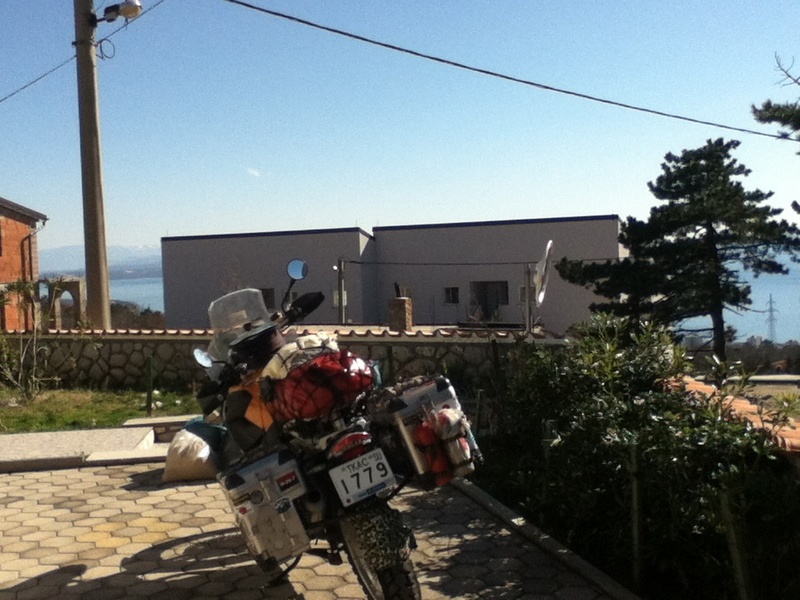 Suddenly I decided to go to Rijeka last night, I could not find any other accommodation with a parking space. But here seems to be a good one! I have a sea view! But there is no shop around, so I have to ride down to the town to get anything. So I rode to the town. 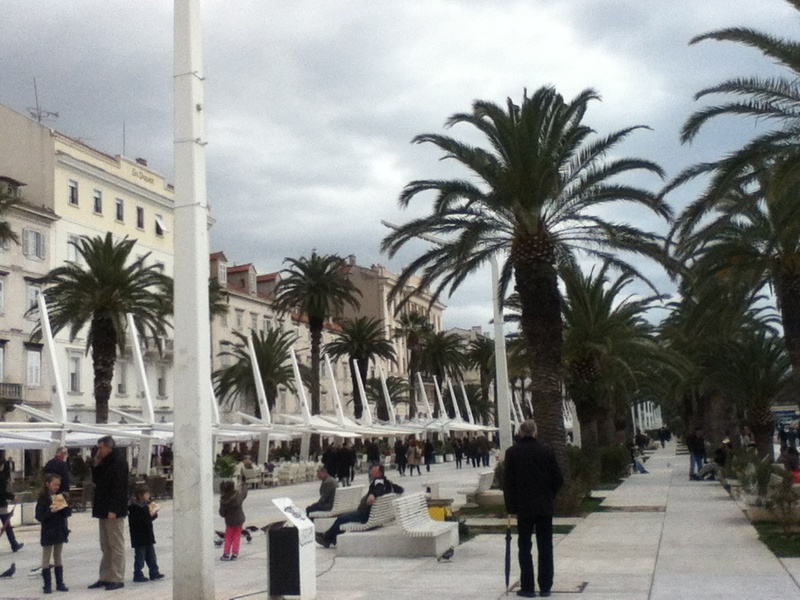 Rijeka is one of the main port town of Croatia. It was used to be a part of Italy as well. 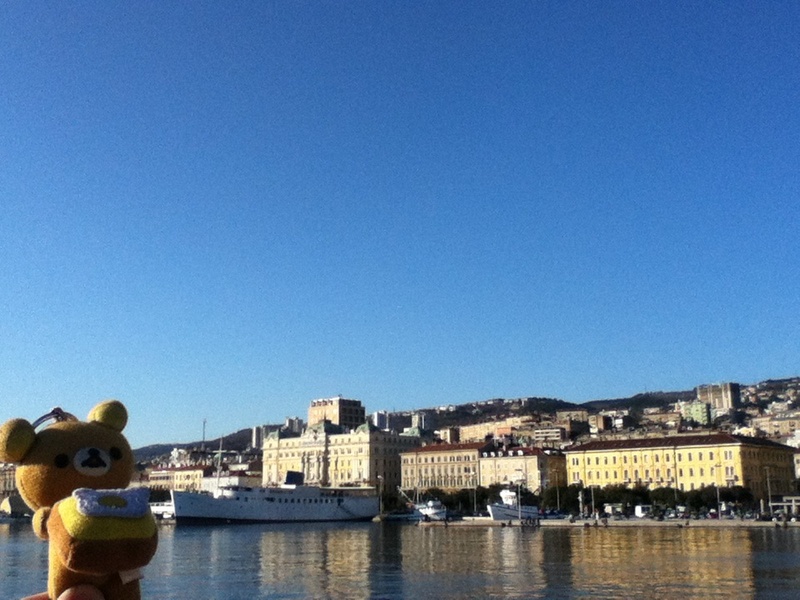 So Rijeka is also know as Italian name "Fiume". 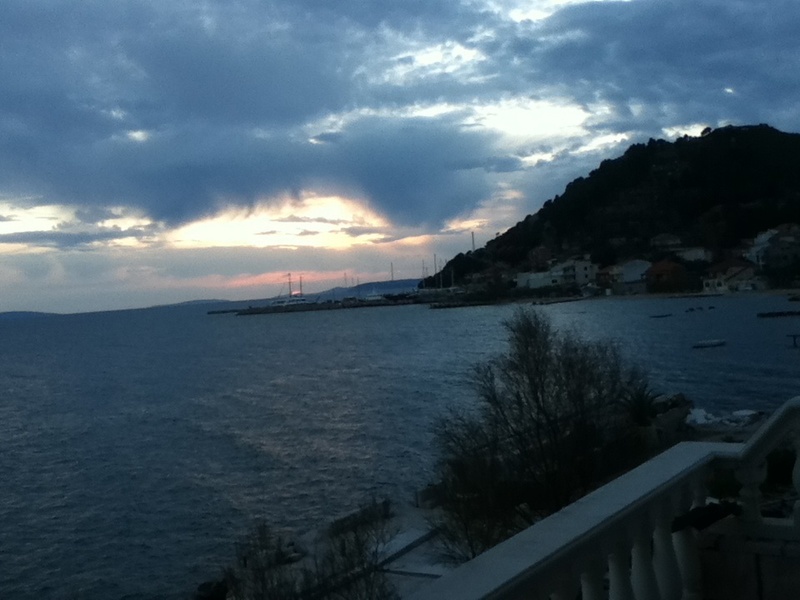 Both "Rijeka" and "Fiume" mean "River". Even though it was a part of Italy, it was the autonomous city. But the great wars changed its fate. Towards the end of the WWⅡ it was occupied by Nazi Germany. The troops of Yugoslavia, a part of the allies, took the city from the hand of Nazi, then Rijeka became a city of Yugoslavia. Then due to the fear of extermination, Italian residents of the city fled to Italy. It has such a sad history. Rijeka reminds me of Genova a bid as the hill rises straight up from the bay. But it has a different atmosphere from Genova. 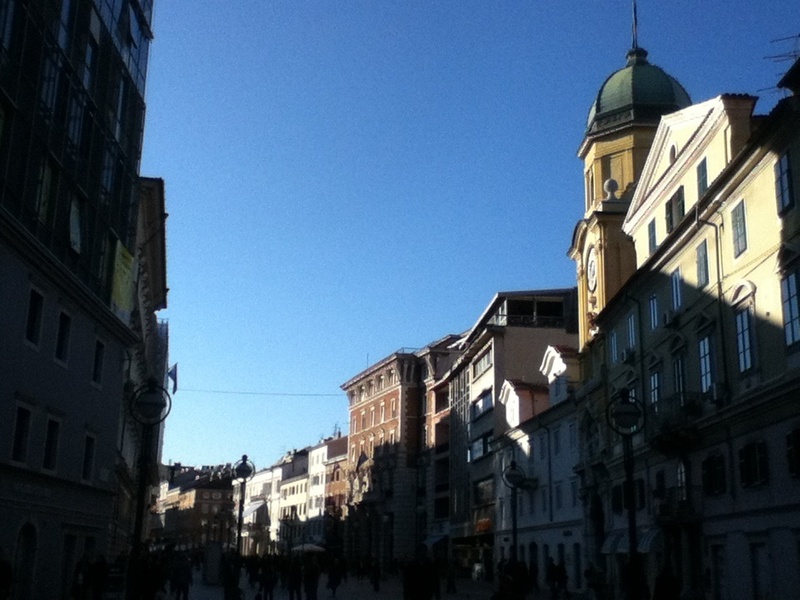 Even though it has the dark history behind, current Rijeka is very open, that I felt. In Maribor, many people stared at me (I reckon they haven't seen much Asian), but in Rijeka none gave any attention to me! That's better! I was walking around the town having a sandwich, then suddenly I felt so so tired. So I went back to the apartment and had a nap. 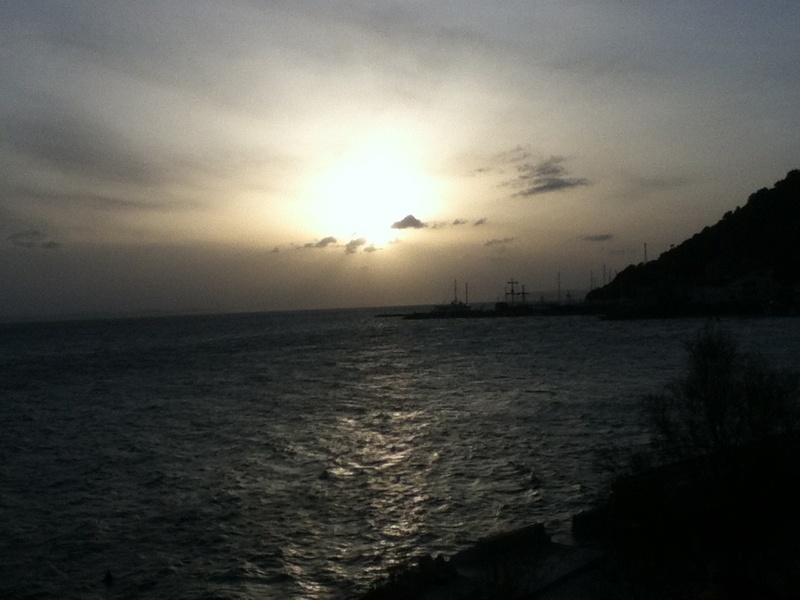 When I got up, the sun set was seen from the window. I did not thing the sea view would provide me such a joy, but it does!